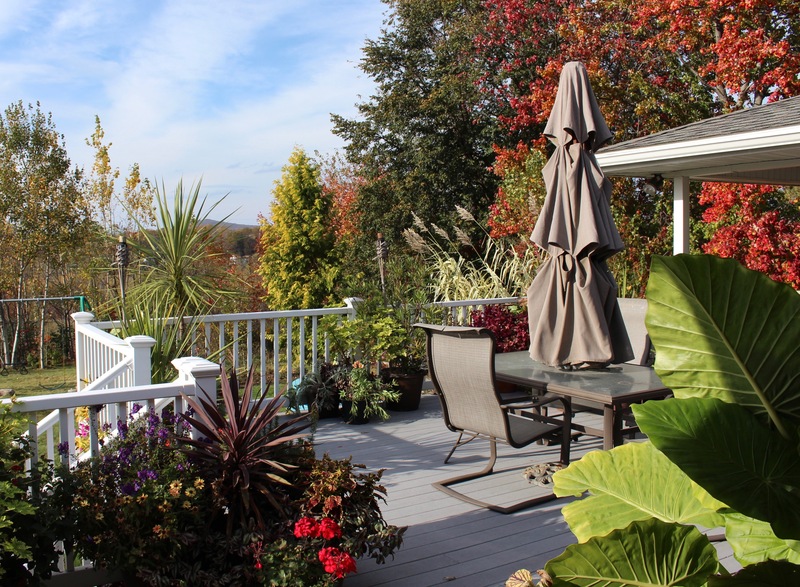 There’s a forecast for snow tomorrow, and in this little slice of near-suburbia things are absolutely not ready. The gardener has been in more of a Netflix mood rather than a slaving out in the elements mood and as a result things are more behind than usual. ‘No big deal’ he says as he dips his hand in yet another vat of overly buttered popcorn, and that pretty much sums up the last few days… except for the weekend. It was sunny yet cold, and after weeks of gloom the sun was a nice change. Just a few more days and out with the pumpkins and in with the boughs of holly. 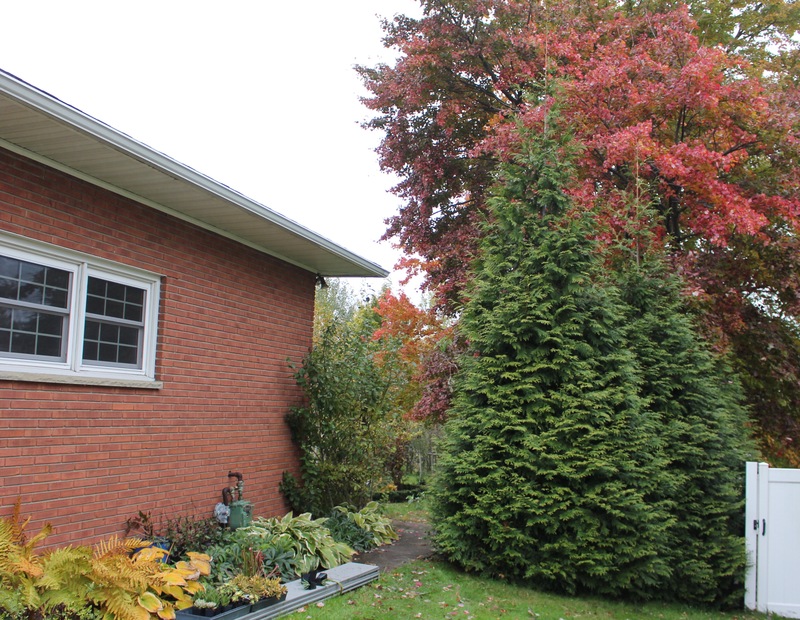 Fyi I’m thinking of moving the arborvitae… any thoughts on that? 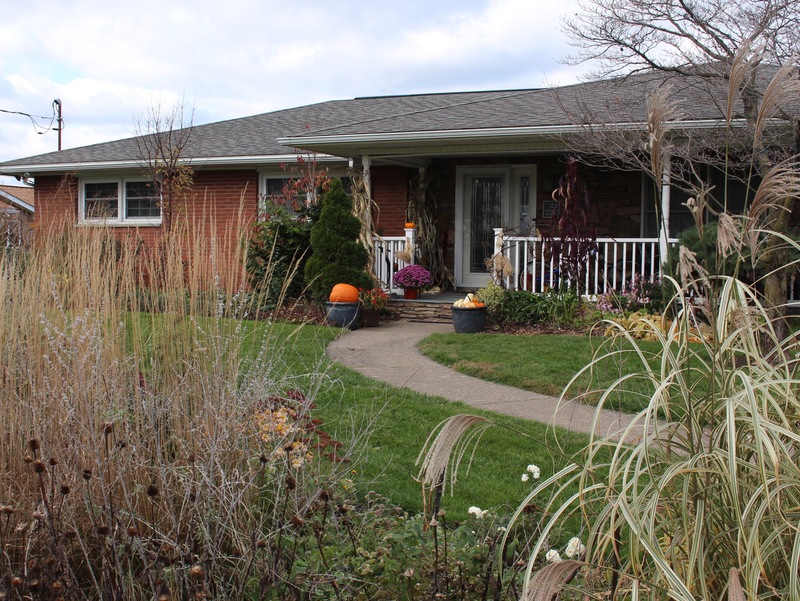 In between re-acquainting myself with a rain-free garden and doing all the fall cleanup in just two days I did a little poking around and tried to find a few things of interest in an otherwise dying garden. 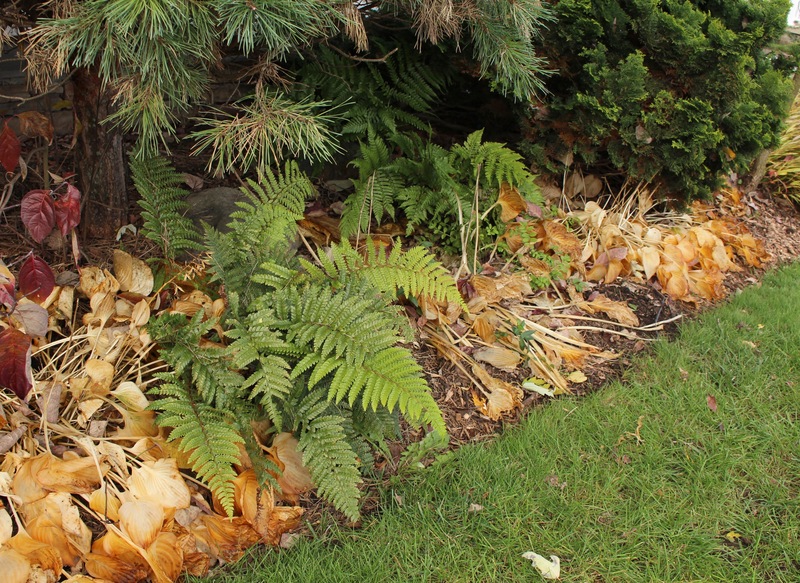 Evergreen ferns look even nicer set off by the yellowed hosta foliage. This is the Japanese Tassel fern, Polystichum polyblepharum, and one of my favorites. 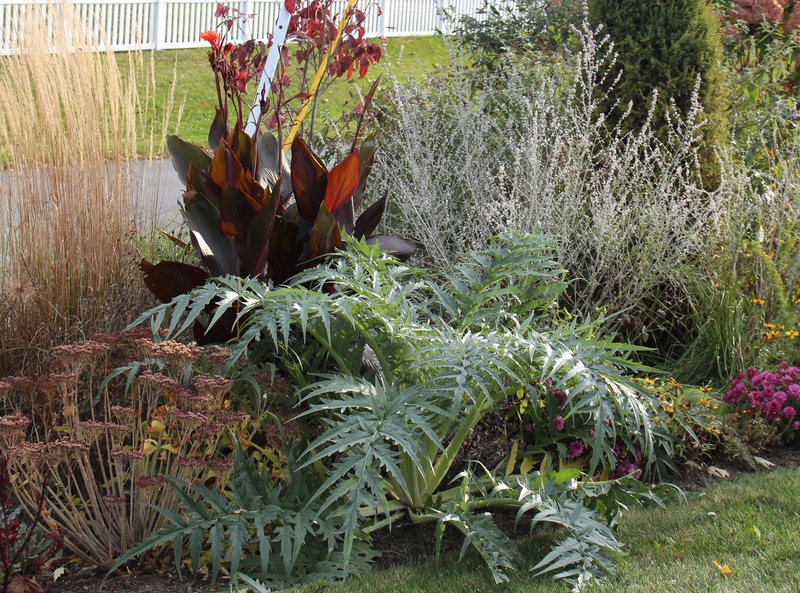 Thick brown fur covers the newly emerging fronds, and the plant as a whole is much sturdier than you might think. There are a few last flowers, but many didn’t hold up well to the relentless rain. 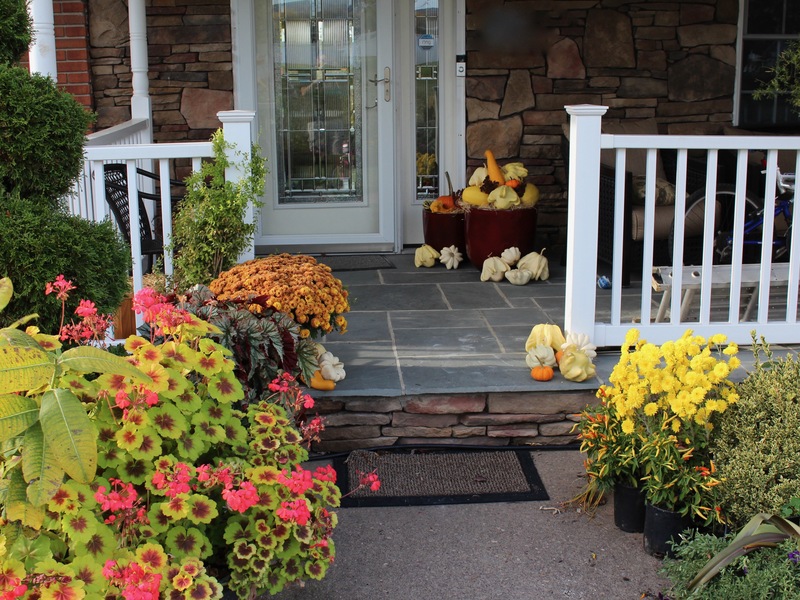 The chrysanthemums are mostly washed out with the exception of a single stray seedling which snuggles up against the porch. I tolerate its sloppiness all year and then finally reap the rewards in November when its flowers open to signal the end of the season. Out along the street the front border got a clearing out so that the earliest spring flowers can have an open stage for whenever the first warm spell hits. Of course that’s code for ‘I planted more snowdrops here’, but snowdrop season comes on fast and I want to be sure I’m prepared for that at least! The interior of the bed has been cleared out and a Rolls Royce layer of leaf mulch put down. They’re the shredded Japanese maple leaves from next door, mixed up with a good amount of lawn clippings which should be delicious for the earthworms. 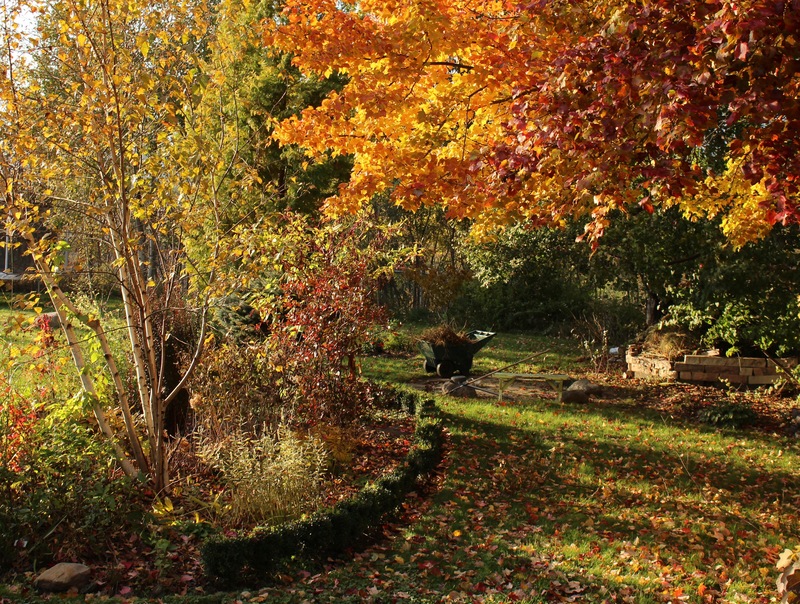 Although I did do some clearing out, the bulk of my fall cleanup is just removing anything which looks overly messy, and then running the leaves over with the mower and tossing the shreddings into select beds. Whatever is left I can just refer to as winter interest and eventually get it come springtime. 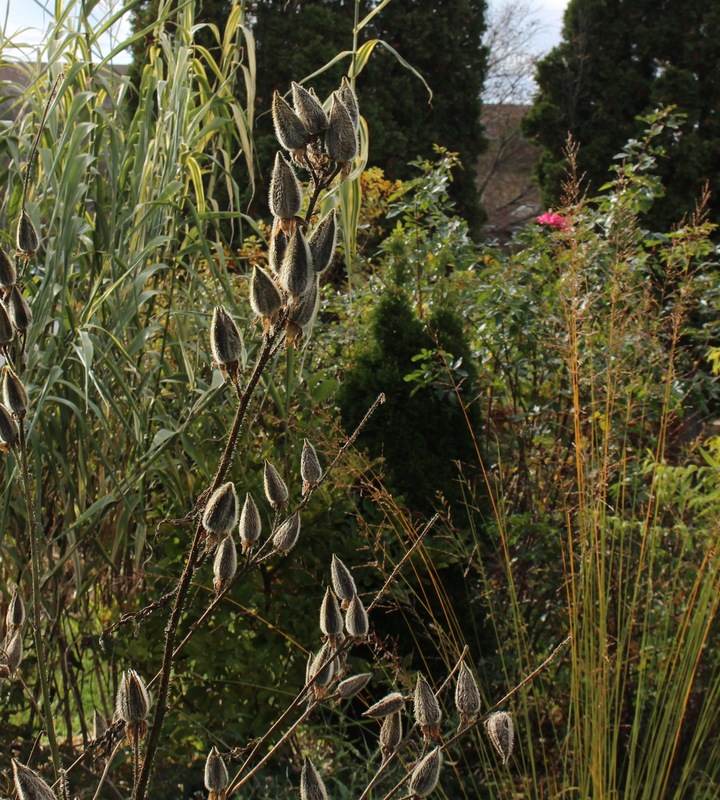 Although it was one of the first plants to go when temperatures dropped, the dead stalks of the abelmoschus still look great with their fuzzy seedpods. Honestly if I had the opportunity I would want about double the amount of leaves that I collect each fall off the lawns. 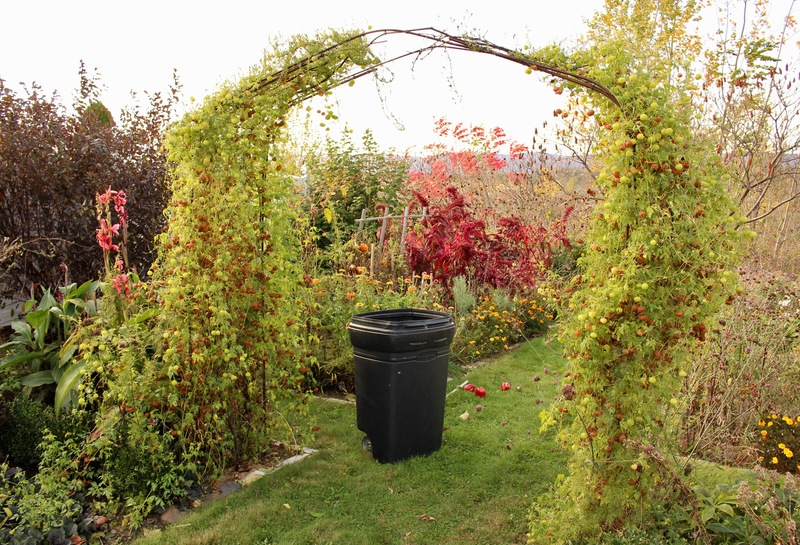 Some would go into the compost, but most just gets thrown back as a winter blanket for empty vegetable beds and sleeping perennial plantings. As it is I still end up volunteering to clean out my Bil’s backyard and then robbing the woods for whatever’s been dumped back there. It’s sad how I covet my neighbor’s fallen leaves. An Asian spicebush, Lindera glauca var. salicifolia was named as my friend’s favorite shrub and I’d have to agree. The seedlings she shared with me are finally coming along and I love the late season glow of their foliage. It’s not all about dead leaves though. Snowdrop talk will come up more and more now that the weather is turning cold. This season I am eagerly awaiting the opening of my new snowdrop walk, and based on all the buzz already surrounding it I’m sure it will be an excellent new springtime adventure. Just in case it’s not obvious the new snowdrop walk enters between the chrysanthemums and carries you across the bed. Most people will need to crawl if they wish to avoid a cherry branch to the forehead, but you’ll be down low looking at them anyway so why bother with a whole bunch of head-room? In the meantime, a few hardy cyclamen line the snowdrop walk. 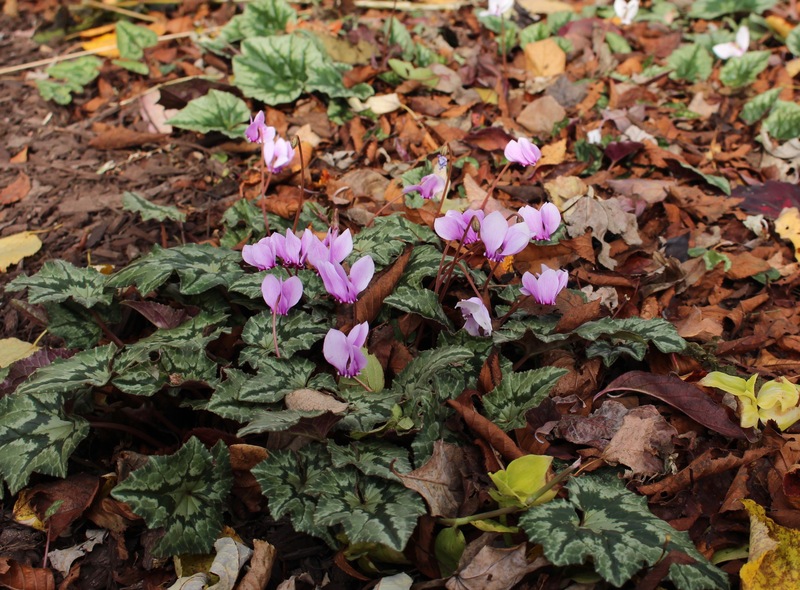 Cyclamen hederifolium is sending up its winter foliage now and the last flowers look even better against the beautifully patterned leaves. It appears I’ve lost a few older cyclamen plants this summer, most likely due to all the rain, but there are still plenty left surviving and multiplying. With the snowdrop walk all prepped and waiting, it’s time to turn towards the next on again off again project. The land beyond the fence. Years back, before the fence went up, I used to mow around a few little quaking aspen sprouts. 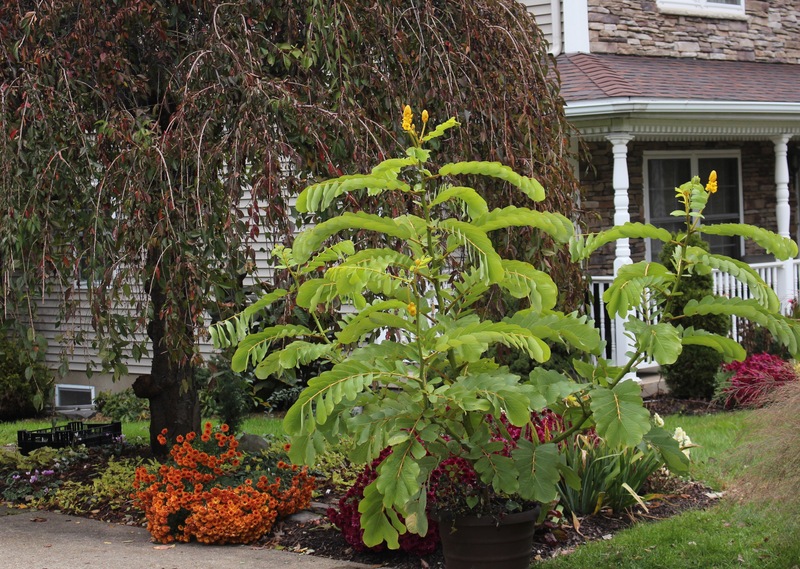 They’ve grown since, and are now sporting some attractively bright bark color. You may remember that my MiL lives next door, and that a few years back I was able to get a bunch of fill dumped behind her house. In the years since, I’ve managed to level and plant the half closest to her fence, but the other half still needs grading and moving. After losing all hope of someone coming and doing the job in a day or two with all the right machinery, I’ve finally decided it will be me who digs and grades and moves all the dirt that remains. My guess is that the rest of my life will be spent digging back here, but I already have a shovel and the dirt is free, so what have I got to lose? Left side graded and planted to grass, right side still to be done. While I’m at it someone’s mentioned they’d like a screen of evergreens planted, so why not add that to the list as well…. 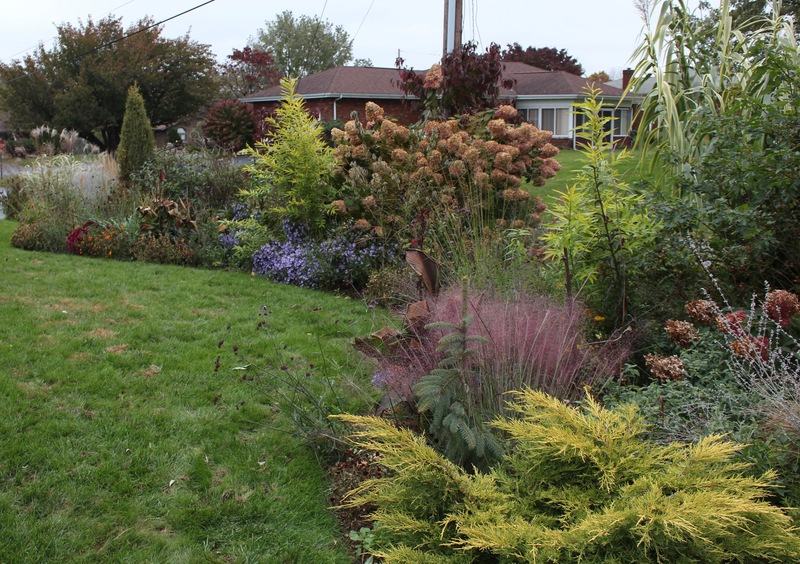 To be honest I did go along the street border and do a little cleaning up of dead things and overly lush grass growth. I feel like the dogwood seedlings have colored up exceptionally this autumn! A lack of life giving sunshine and constant moisture must favor a colorful death process because whatever the endless rain hasn’t moulded up is showing a wonderful range of pinks and purples. 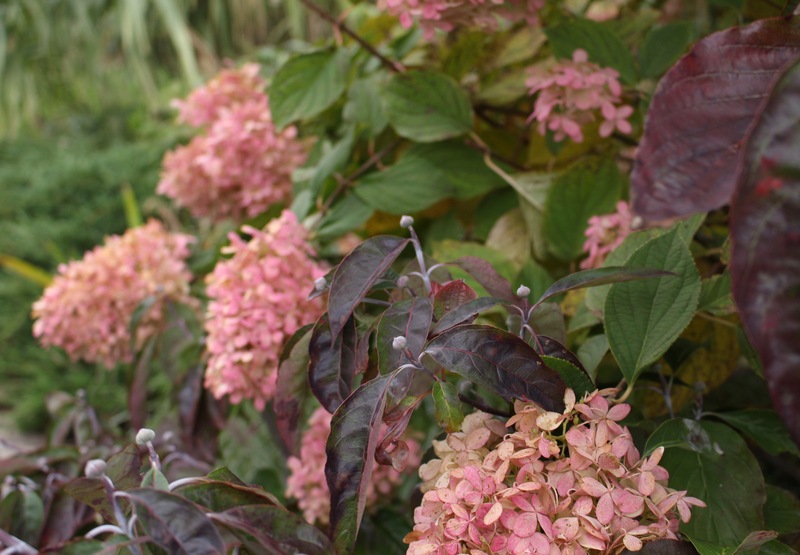 Usually the hydrangeas go straight to brown, but this year even ‘Limelight’ has taken on a bright pink hue. The colors of autumn with a promise of spring in the tight buds of next year’s dogwood blooms. 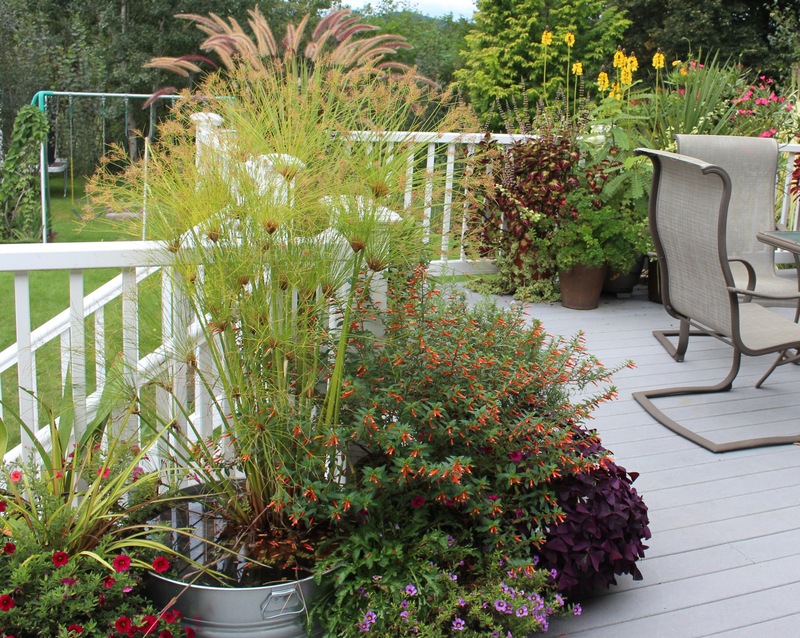 Frost has taken down the bright annuals out front, but asters, grasses and plenty of yellow foliage remain. ‘Golden Sunshine’ willow makes a nice yellow accent alongside the pinks and purples. It’s really enjoyed the rainy summer and one in the back yard has probably put on a good ten feet of growth this summer. 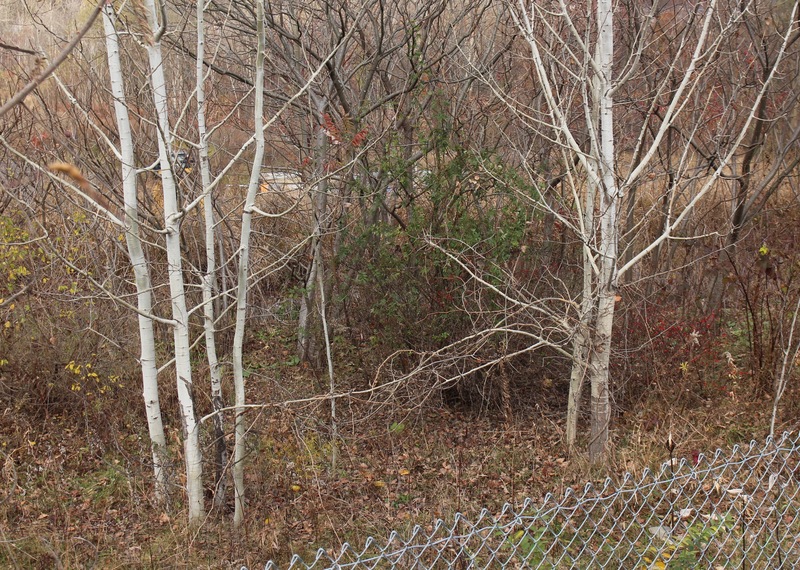 All of the willows will be cut back to the ground this winter. All the tropicals which earned a spot indoors have come into the garage, but my one potted candlestick bush (Senna alata) still gets dragged outside for warmer spells. It’s managed to put out a few weak flowers and of course I’m thrilled to get it this far. Maybe I can cut it back and overwinter the plant indoors, but I’ve killed enough plants over the years that I don’t have all that much hope of pulling that off. Candlestick bush soaking up the last of the above freezing weather. While we’re over by the garage I can’t help but think that the ‘Green Giant’ thuja is going to need some attention one of these winters. It’s a big tree and I’ve got it planted ten feet from the garage and maybe four feet from the walk. When I planted it ten years ago the plan was for a quick screen from the house next door, and it’s done a great job, but trimming is not something I want to deal with every year. Even with a ladder I can only safely reach about halfway up so I’m considering either leaving them go for the next five or ten years, or topping them and giving them one harsh trim and see what happens. A review of previous experience leans heavily towards doing nothing for the next ten years and then suddenly cutting them to the ground one morning when I need a spot to plant my latest, newest, most amazing plant. We’ll see. I have to confess a love for arborvitaes. They’re common and maybe even overplanted, but I love them. Here are my ‘Green Giants’ growing just like they should, planted in a spot where perhaps they shouldn’t. 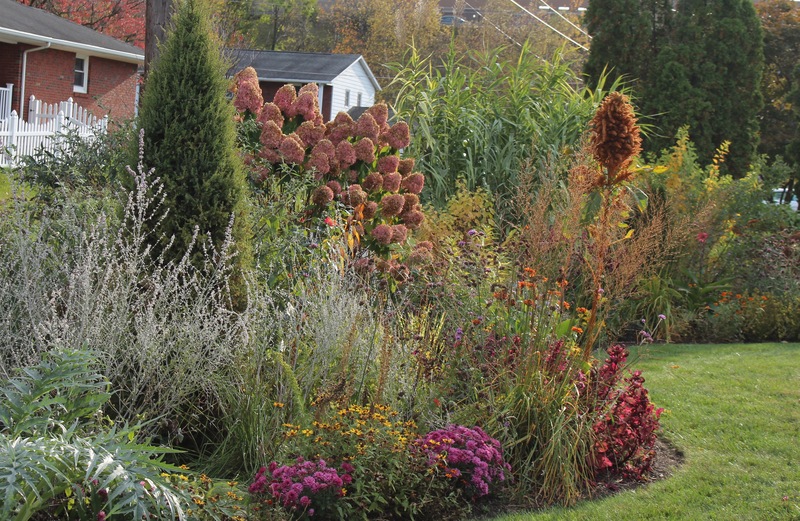 Following the confession of poor planting decisions here are a few autumn colors to distract. 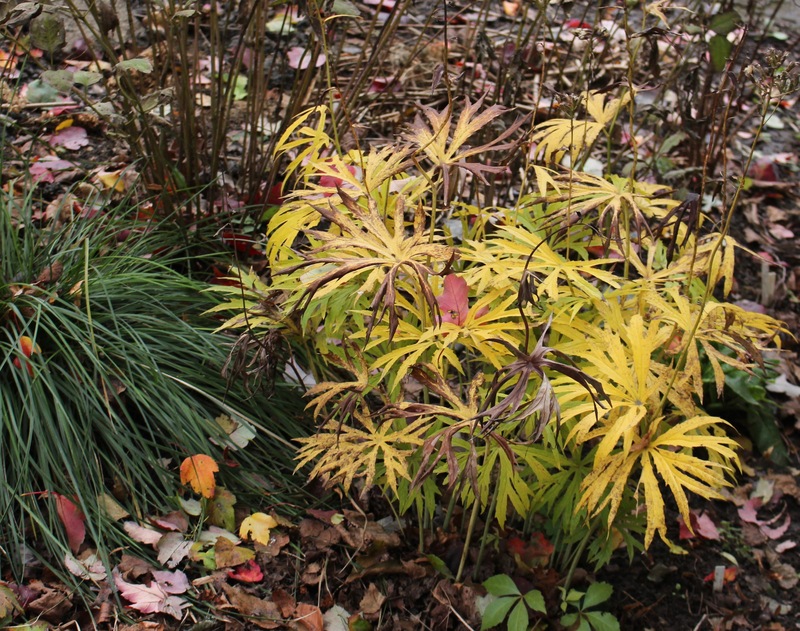 The shredded umbrella plant (Syneilesis aconitifolia) coloring up for the fall. Following this weekend’s rain I’m sure leaf cleanup will need to begin. I know I claimed to be considering waiting for the winter winds to take care of them all, but I’m far to greedy to give up the leaf mulch. A few rounds with the lawnmower should get me enough to mulch some of my most special plantings. 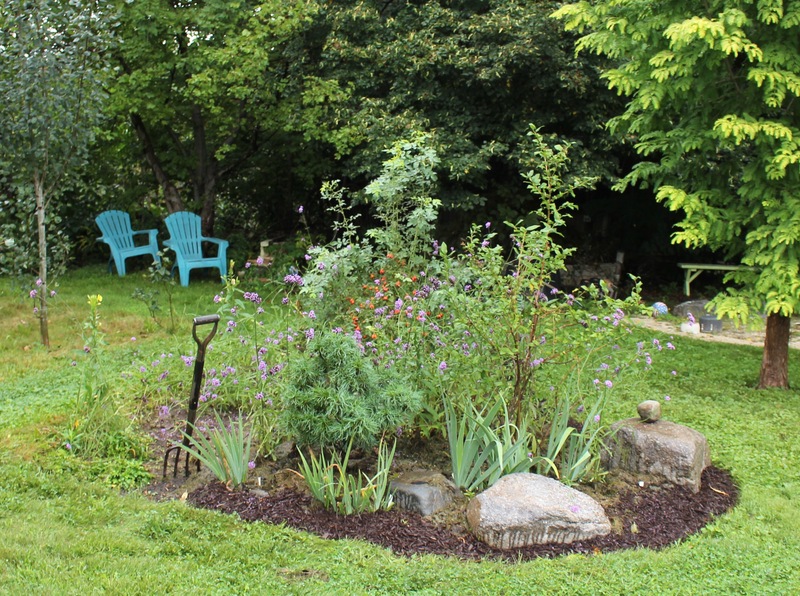 The compost pile is there to the right, the full wheelbarrow just ten feet to the left…. am I really that lazy that I couldn’t just make it all the way? More fall color to distract. 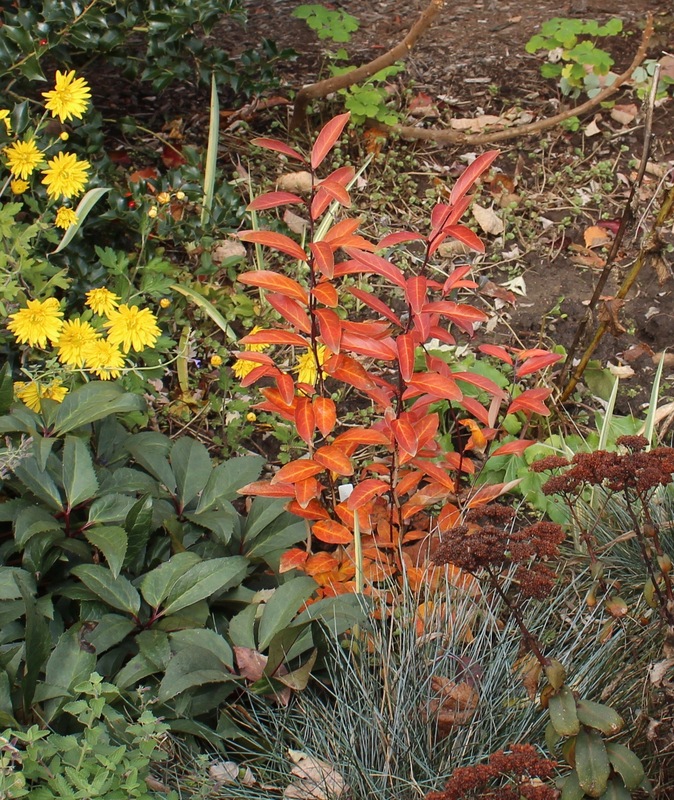 Stewartia is always a star for fall color, especially when not coming off months of drought. Not to change the subject too much, but just as my wonderful teepee of spanish flag vine (Mina aka Ipomoea lobata) was finally coming into bloom, the temperatures dropped just enough to frost the bulk of it, so here’s a single sad photo of all that’s left, rather than a ten foot high pyramid of celabratory oranges and reds. Fortunately some snapdragon vine (Asarina scandens) held up to the cold with their cool little purple flowers, and some chrysanthemum followed along behind, also pretending to be climbers. I may just skip the flag next year and go all snapdragon. The last lingering flowers in the ‘vegetable’ patch. 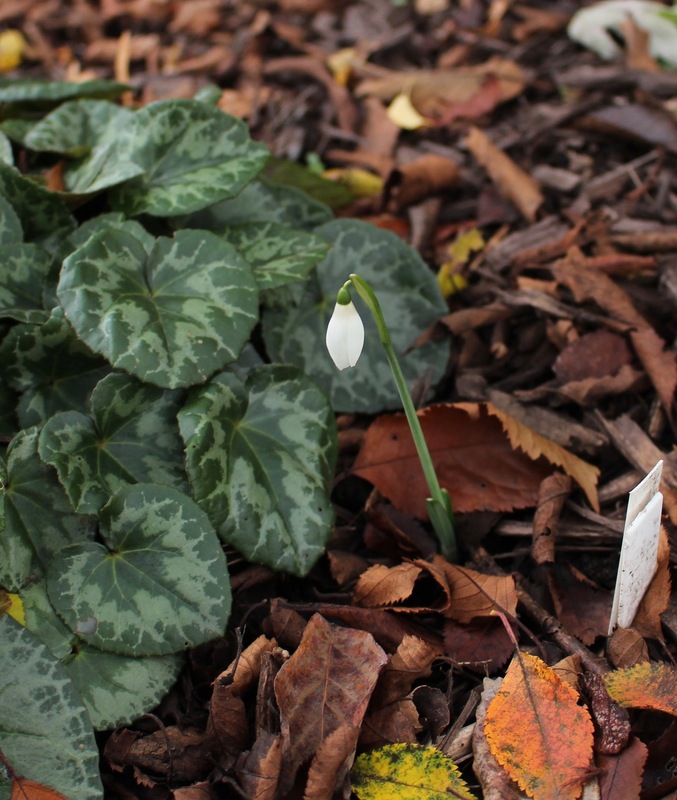 Galanthus peshmenii, new this year and my first attempt at growing a fall blooming snowdrop outdoors. So that’s it from this end of Pennsylvania. I saw a dash of sunshine just a few minutes ago but just the fact it’s stopped raining is a big step forward in my opinion. Let’s hope at least one day this weekend offers the garden and the gardener a chance to dry out and get something productive done. All the best! 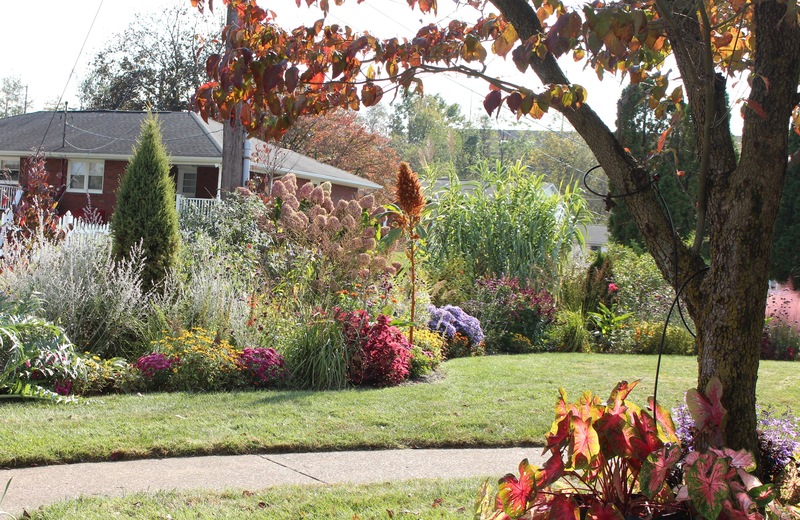 Change for the changing seasons always brings an antsy-ness to this gardener, and autumn is one of the big ones. An avalanche of pumpkin spice covers nearly everything and so many people are just done with the summer garden and all its weather-worn tiredness and spent seediness. I’m with you. I keep eyeing the mess and think I might just be better off wacking it all down and calling it a year. It’s been months since the garden had that clean and controlled look when plants were bristling with anticipation, and I miss that, but still won’t give in just yet. Obviously laziness plays a part, but others with more enthusiasm might want to hold off as well. 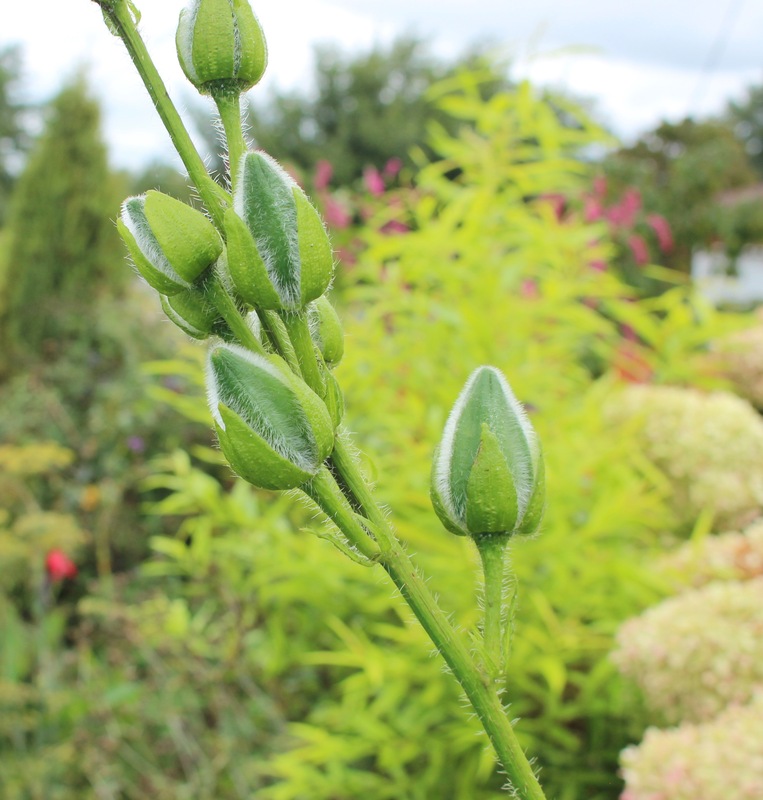 The waning garden has a purpose, and between the full seedheads providing food for birds, and the dried stalks protecting next year’s buds, there’s still something of interest out there. Frost and snow sit more attractively on waving stalks than on dull mulch, and honestly as far as cleanup goes it’s easier to crunch dried stalks in March than it is to wrestle with sloppy, soggy, heavy messes in October. But it looks dull. and messy. and like you gave up… Unless you planned for it of course, and planted something that carries on until the pumpkin spice gets shoved over by cranberries, and a more relaxed season begins. For me annuals do the trick. Abelmoschus manihot, an okra relative, soaked up the rain and humidity this summer and has never done better. These first flowers in late August were just the start of the show. Ok I said it. I plant annuals. 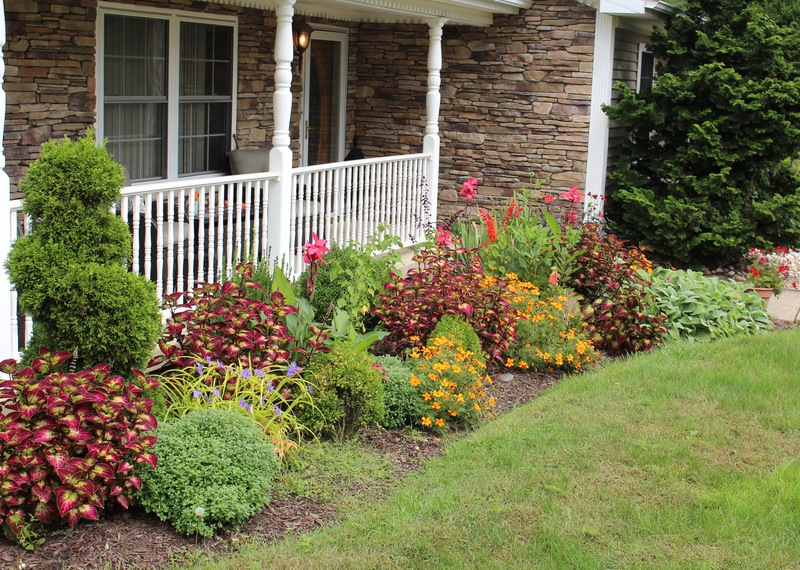 Yes, they’re more work, but the right annuals can pretty much take care of themselves, and they don’t have to be the same dull mat of color all year that even the bees get bored with. By their nature these plants just want to grow up and seize the day, filling as much space as possible with growth and flowers until whenever. They don’t care about next year, just flowering and seeding. The fuzzy okra-like seedpods on the abelmoschatus (aka sunset hibiscus) are cool as well. Sure beats looking at spotty, diseased iris foliage (which is actually hidden behind the planting). Ok, enough of me trying to sound intelligent and write coherently in what could be a useful post. 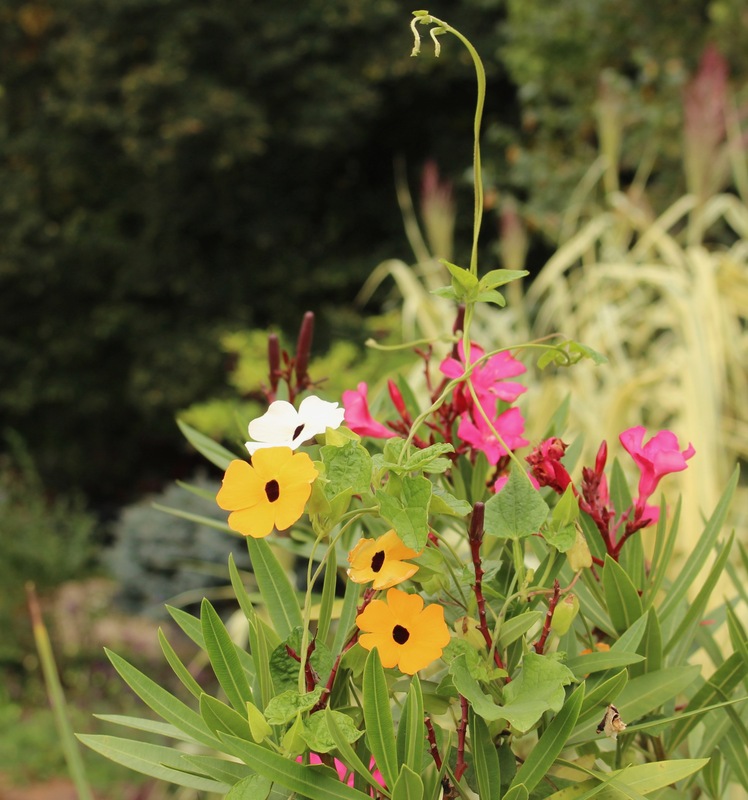 Here are some other annual plantings from around the garden which are distracting me from all the gloomy skies and ever shortening days of really late summer. Coleus feature strongly. Nearly all come from a handful of cuttings I stuck in a glass of water and kept on the windowsill all winter. They look terribly pale and leggy by March but that’s when I pot them up and start growing them on under lights in the basement. By May I have dozens to fill in around the garden. There were even enough leftovers this spring to branch out next door and fill in my neighbor’s mulch bed. 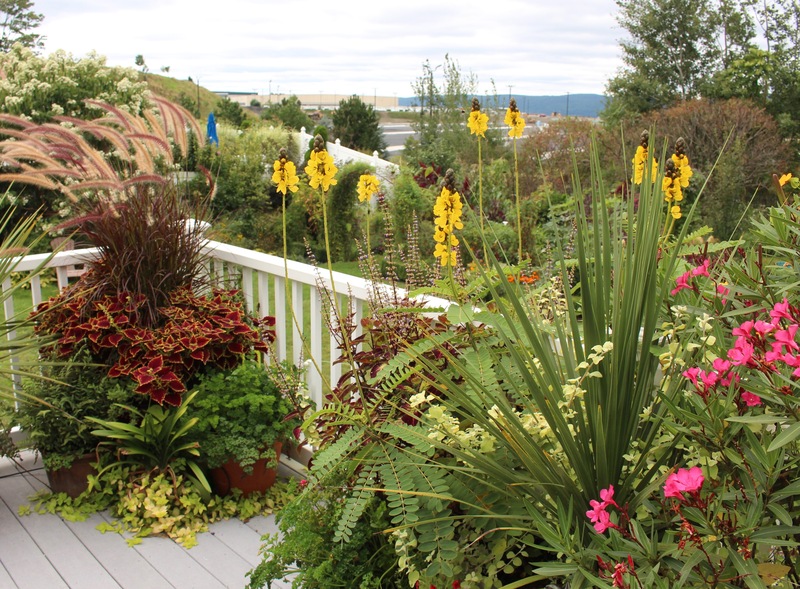 Coleus, cannas, and a nice little single marigold I call “stole a seed head while visiting Kimberley last summer”. I guess technically a lot of what I’m calling annuals can actually be grown as perennials in warmer climates, so I don’t want to upset anyone who lives and dies by those definitions, but in my garden these plants identify as annuals so I’m going to respect that. 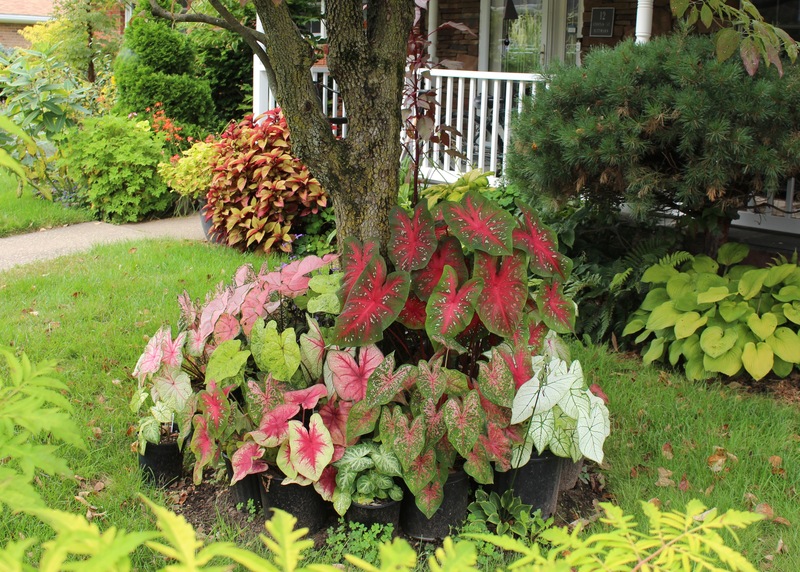 The dogwood may be giving up and putting on some autumn color, but the potted caladiums are holding on a little longer until nighttime temperatures consistently drop below 60F. That’s when their sadly limp selves get thrown pot and all into a warm, dry corner of the furnace room and sit there dry and dormant until next year. A real annual which has come up well this year is Browallia americana. In well watered spots of bare earth, close to where it grew last year, I keep an eye out for seedlings. 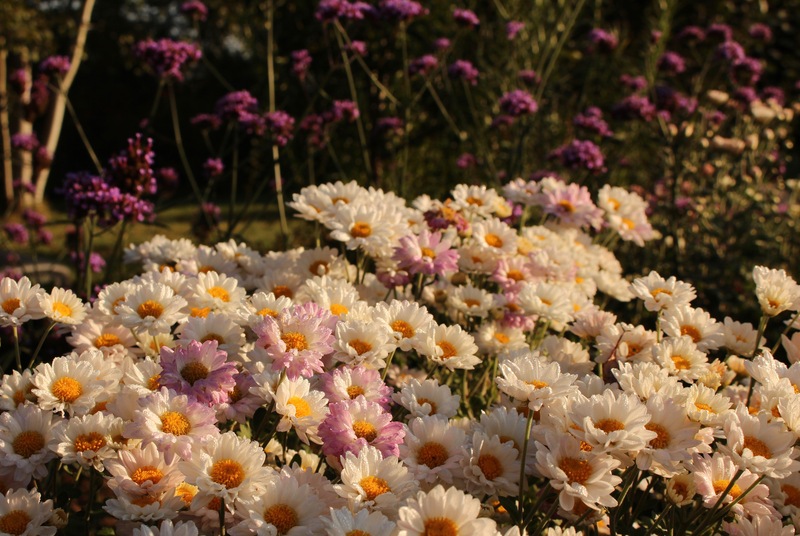 All that’s required is take care and not pull them out as weeds, and by late summer the reward is a 1-2 foot bush speckled with flowers a little bit towards the amethyst side of blue. 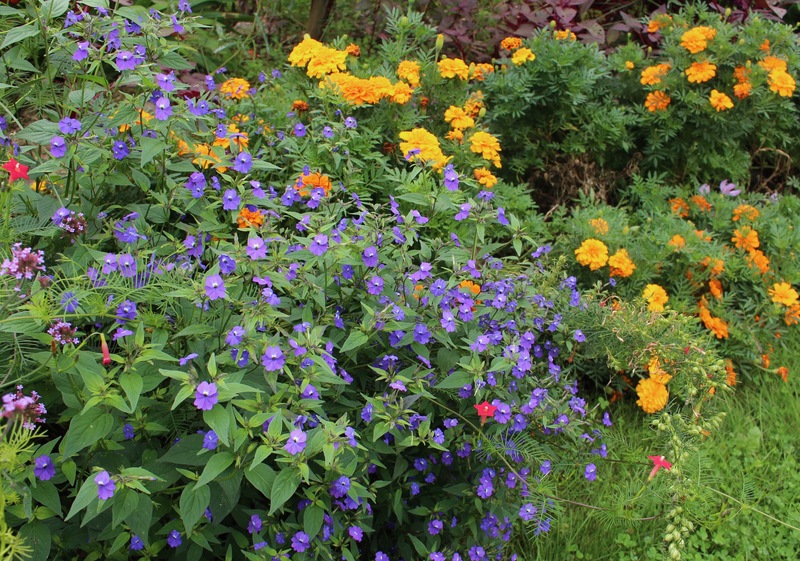 Browallia americana with just a few tasteful selected marigolds. A sort-of annual for me which sometimes returns from the roots is the borderline weedy Datura metel (aka moonflower). 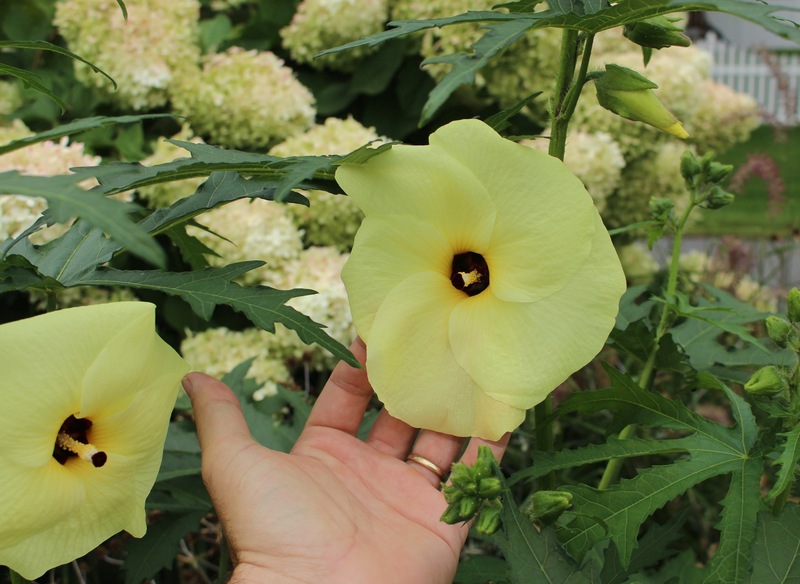 In good fertile soil it makes a large shrub which in the evening sports pure white, upward facing trumpet flowers. Some people call them angel trumpets, but that’s incorrect. Angels trumpet come from on high with downward facing blooms and are a different group of flowers (Brugmansia). These flowers always come from below and Devil’s trumpet is more accurate. You would think the more heavenly version would be more innocent, but both are extremely poisonous and there are deaths from this plant each year. I remember my mother evicting them from the garden one summer when she found out. I know she told us all how poisonous they were but still I was disappointed to lose them from the garden. I’m surprised she hasn’t questioned my parenting skills since seeing it in bloom here, but I guess there are always plenty of other questionable goings on which take precedence. 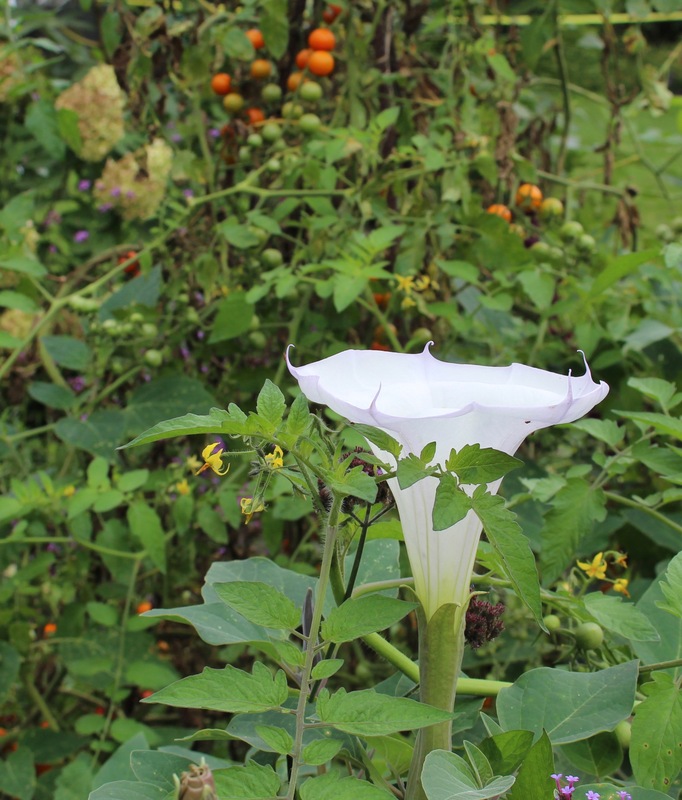 Devil’s trumpet (Datura metel) announcing an unwelcome arrival in the vegetable garden. But there I go babbling again. As long as we’re in the vegetable garden, let me celebrate the pumpkins which have come on strong now that the sunflower thicket has died off from some likely disease. All this took were a handful of seeds ripped from the heart of last year’s halloween decorations. Now that the sunflowers have died off it looks like the backup plan of pumpkins and glass gem corn might just work out. I love pumpkins and gourds, maybe that’s all I’ll grow next year. The ‘Prince Tut’ water garden is ok. Goldfish have hopefully made a meal of any mosquitos, but a lack of fertilizer has left the papyrus healthy but a little yellowish in my opinion. 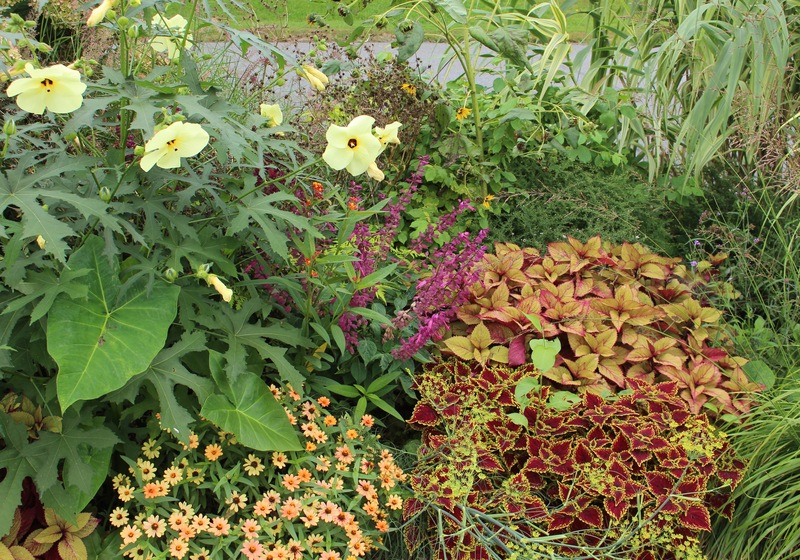 I tried for more foliage color this year but still ended up with a few curious flowers here and there. The firecracker plant (cuphea) was a Proven Winners thing that I’ve heard good things about, and here it is three months later still looking good. 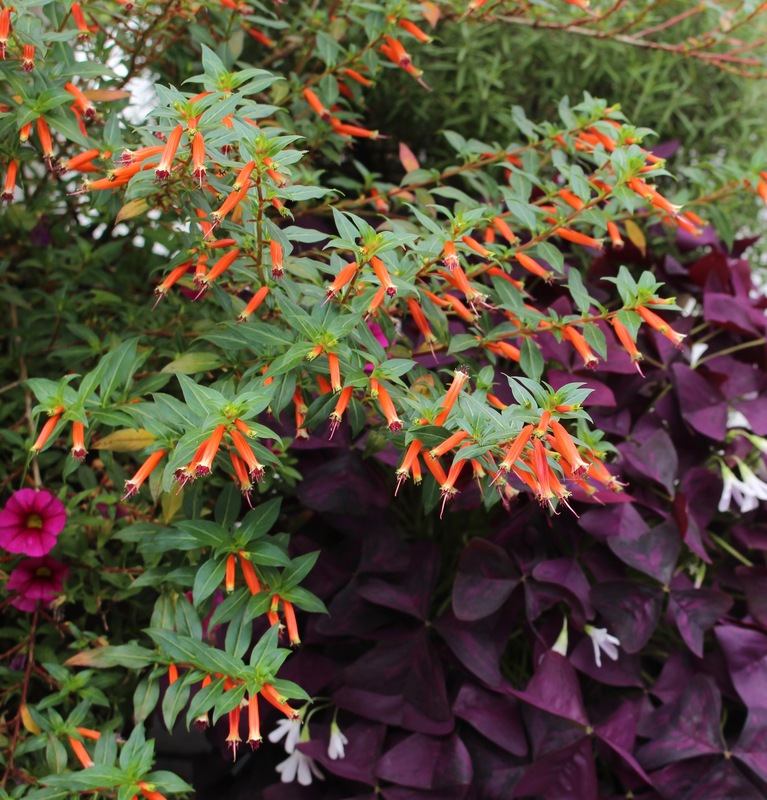 Cuphea (firecracker plant) and some purple leaved oxalis. Both have been nonstop color and trouble-free from the day they were planted. My popcorn plant (Senna… Cassia… corymbosa)? Still awesome 🙂 I was even able to get a few seeds to set, although it did seem to interfere with the flowering for a few weeks. 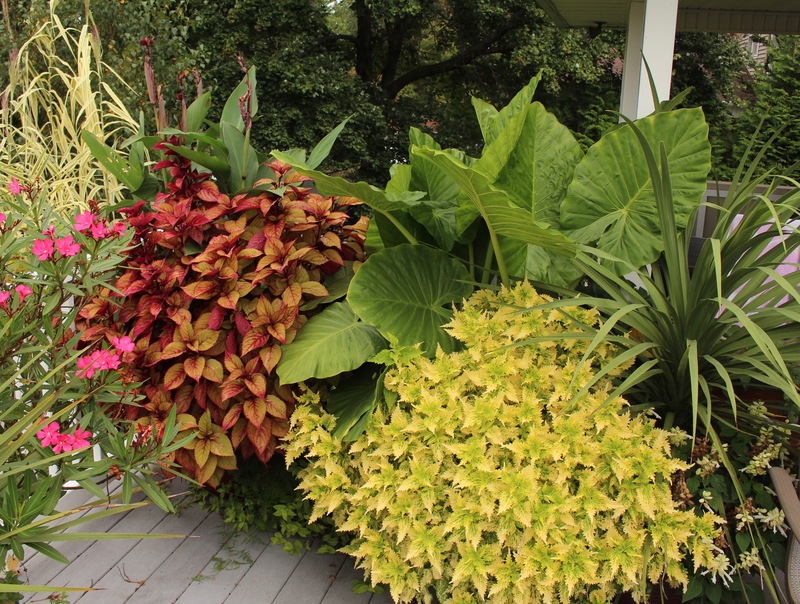 The yellow popcorn plant, coleus, purple fountain grass (pennesutum), oleander, and a bunch of other non-hardy stuff. I’ve had that pink oleander for a few years now and was sure I killed it in the garage last winter. It eventually managed to come back, but the sparse branches were just calling out for a vine to cover them up. Black-eyed Susan vine (Thunbergia alata) to the rescue! The containers at the back end of the deck have officially taken over. The yellow coleus is my one new one for this year, the rest of the mess were just little overwintered sprigs and roots which I put out in May. The coleus really should have been pinched back a few more times. They’re bushy enough, but even I can see they’re just a little too big. 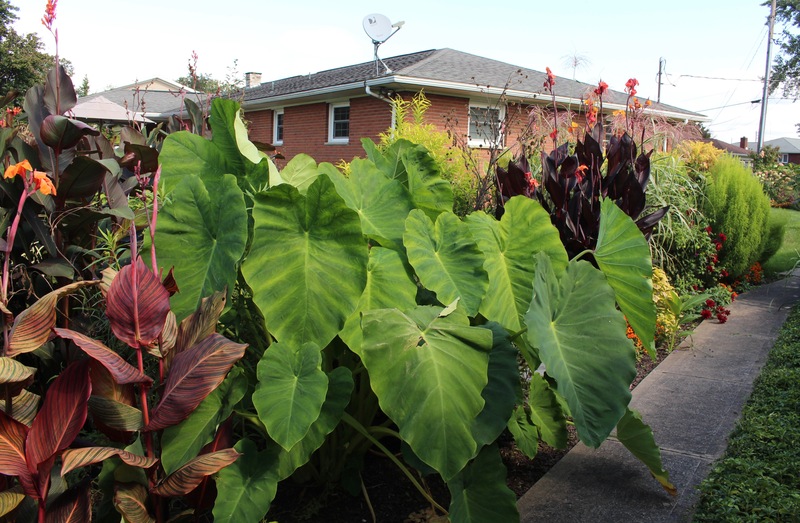 I didn’t think elephant ears could reach six feet tall but between nonstop rain and a good mulch of grass clippings they and the cannas do seem happy. The humidity and heat are gone, only to be replaced by on again off again sunshine alongside a repeating dose of rain. Yay. I won’t even try and convince myself summer is holding on. The calendar says fall and I guess the garden is saying it as well this year. 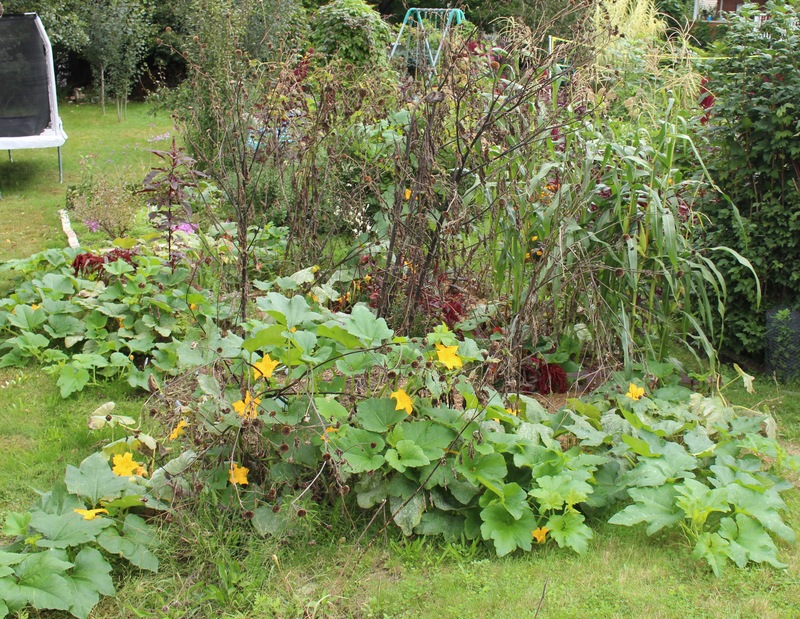 The potager is now an overgrown seedy mess of lingering flowers and floppy overgrowth. We had company for a week and then I had the pleasure of entertaining a head cold for the following weekend, so if the general decay of the season wasn’t enough then the two weeks of neglect probably did the trick. A few things did happen though, so I guess any attempt by the gardener to keep his head above water is a plus. The hedge was trimmed. As usual I love it, and of course it’s inspired me to edge and mulch as well. Before I get too rushed in putting this post out, I suppose some mention of this years budget ambitions should be noted. Weeding was becoming torture so a few bags of mulch were purchased. I find mulching to be slightly addicting so the first load was followed by another, and then another. All said approximately $44 dollars of very cheap and questionably dyed hardwood mulch was purchased, and to be honest I feel really good about my broken resolve. While mulching I came across a few colchicum corms and remembered offering extras to some friends last fall. As it is with these things a quick online search for proper names and spellings led me to distraction and also to a few coveted colchicums which I’d been hoping to get elsewhere. For just $63 and a mouse click I didn’t have to worry about elsewhere anymore. A good example of general neglect. 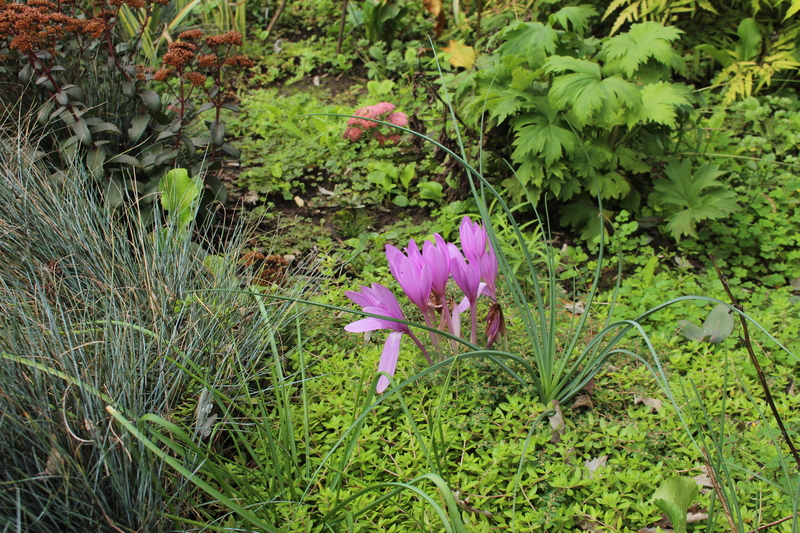 Colchicum ‘Nancy Lindsay’ bravely flowering over a carpet of weedy sedum and other sprouting nasties. While I’m baring my plant buying soul (with the exception of snowdrop purchases of course) I might as well admit that general colchicum excitement led me to a second purchase, this time from Daffodils and More. I have sworn off new daffodils this fall, but obviously the “More” part was a problem, and in this case it amounted to $65 more. 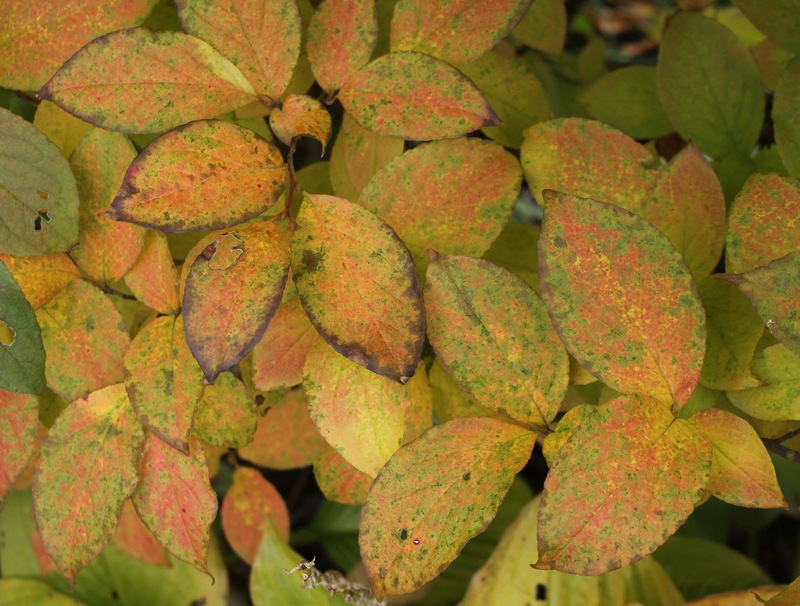 Nice pink highlights on ‘Limelight’ hydrangea this fall. They may be floppy from all the rain, but at least they’re not heat blasted and brown. I haven’t been entirely innocent in the plant department either. Most of the summer passed far too quickly to spend time at the nursery, but my foggy memory does recall going over on a gift certificate (the amount of which does NOT count) by about $38 and then returning a few days later to spend another $18. 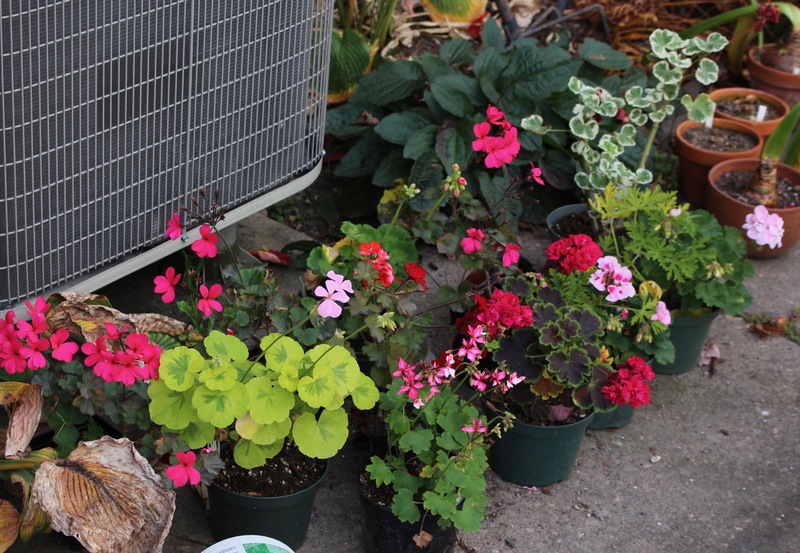 Those plants may or may not have all been planted, but I have to say it would be stupid to buy them and HAVE to have them and then let them sit next to the garage for weeks unplanted. 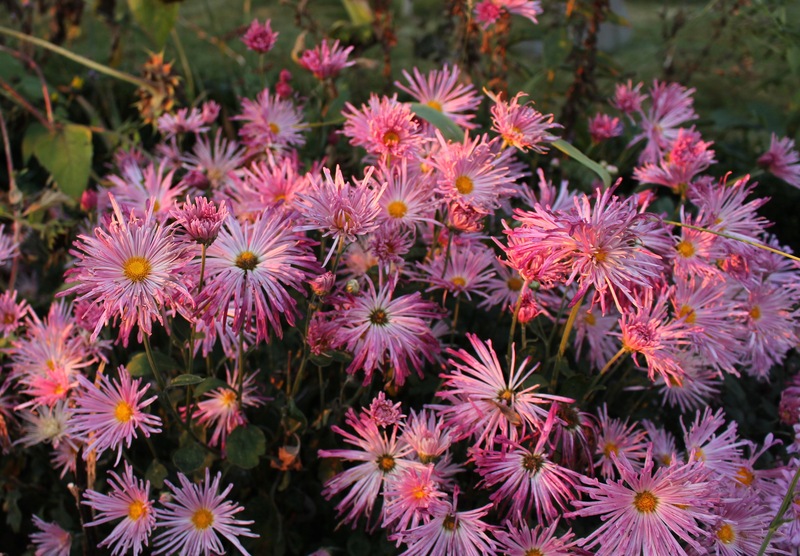 Each fall I’m fascinated by the variety of mum seedlings which have arisen from the double red ‘Mammoth’ mum towards the back. Each spring I forget about mums and never get around to separating these out. If I do admit to neglecting full price purchases on the driveway for weeks, I probably shouldn’t suggest that I went back for a 40% off sale and spent another $49. Just in case that happened though I’m going to add it to this year’s tally and not mention that more pots have joined the driveway crew. The overflowing tropical border. 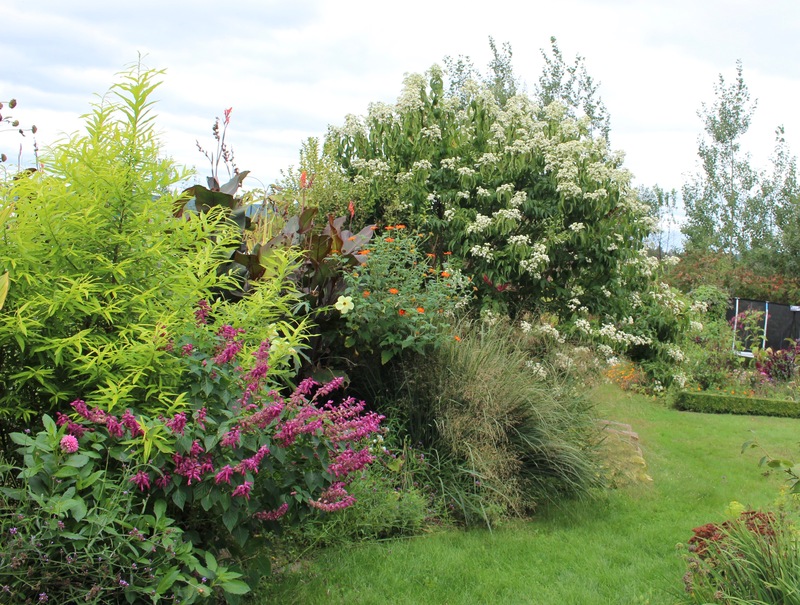 The Seven Sons Tree (Heptacodium) is in full bloom and has put on quite some height over the last few years. Speaking of pots I bought a nice ceramic one on clearance for $15. Like everything else I didn’t need it but maybe I will, so better to just bring it home. The Monarchs have surprised me with an early appearance. They’re enjoying the flowers of the Seven Sons Tree, you can almost make out the namesake flower buds which have a number one son bud surrounded by six more sons. That might be it on budget confessions. Over the last few weeks I’ve probably forgotten a few receipts here and there, but in my opinion a quickly fading memory is one of the greatest benefits of the aging process. Perhaps in hindsight writing it all down wan’t the best thought out of plans. Better to throw in a distraction such as one of my fantastically edited cinematic masterpieces which I call “All the Monarchs which swarmed the Heptacodium last week”. 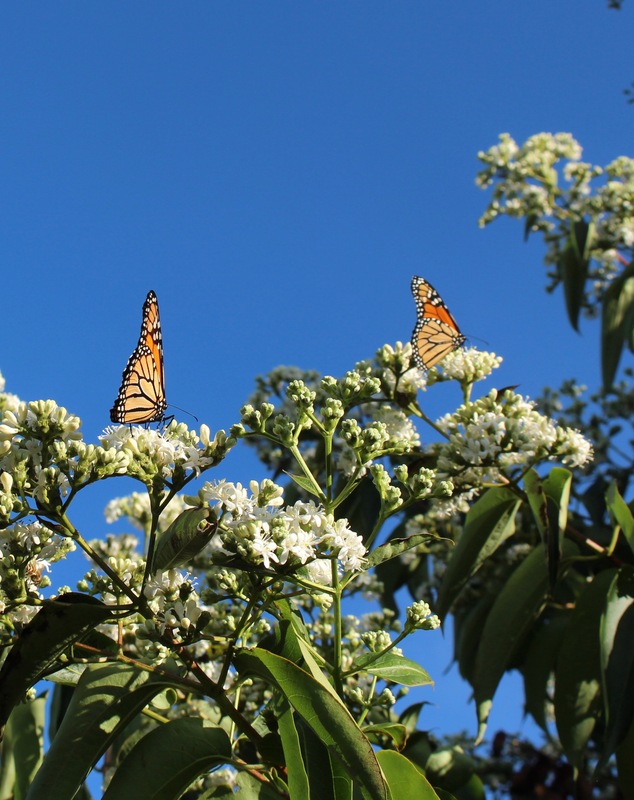 I loved watching all the Monarchs. My parents were in and marveled at all the bugs and butterflies which they just don’t see any more in their more suburban lot. I hope it’s just a one season anomaly for them, but when you hear the stories of disappearing bees and bugs, and vanishing bird populations, and crashing amphibian numbers, you can really worry. As the afternoon rolled into an amazing sunset, we watched the lingering insects wander off and several bats move in to swoop and ambush the careless, while all the nighttime crickets and katydids started to ratchet up their chorus. It wasn’t bad at all. 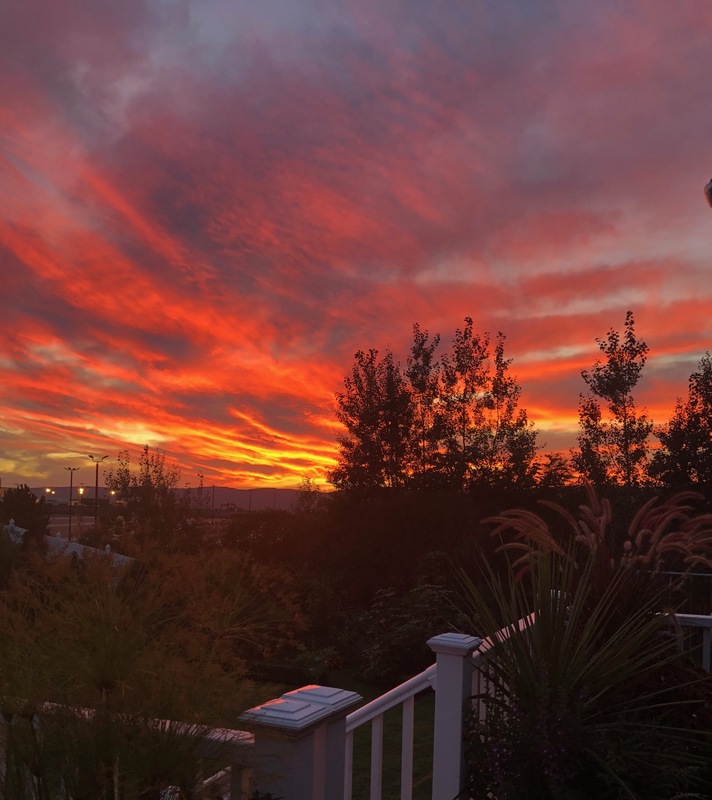 September sunset on the deck. $992 total so far for the 2018 gardening year. 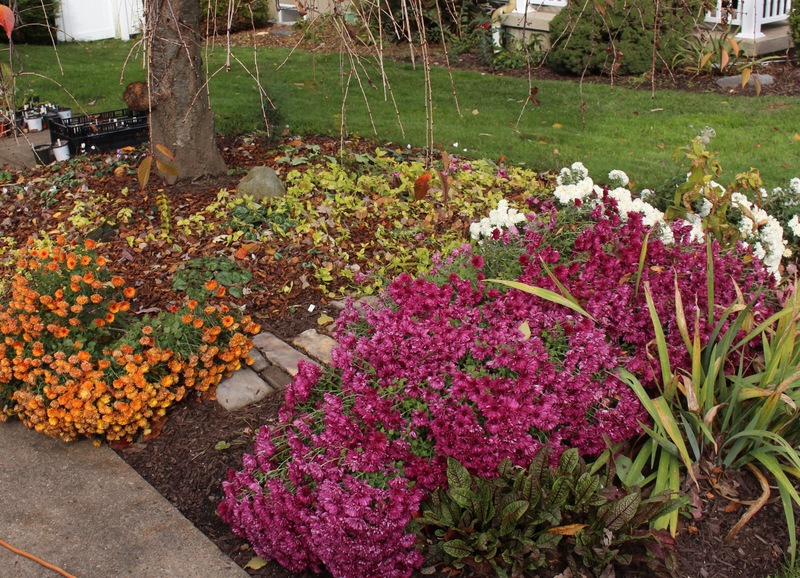 The low autumn light smooths out a lot of the wrinkles and age spots of this elderly border. A good rain sure didn’t hurt either! Part of me wants to get to tidying up the border, but logical sense tells me to wait a few more weeks. Right now everything is still solid and wet and a lot bulkier than it will be after a good freeze or two, so waiting a bit will make the work much easier. 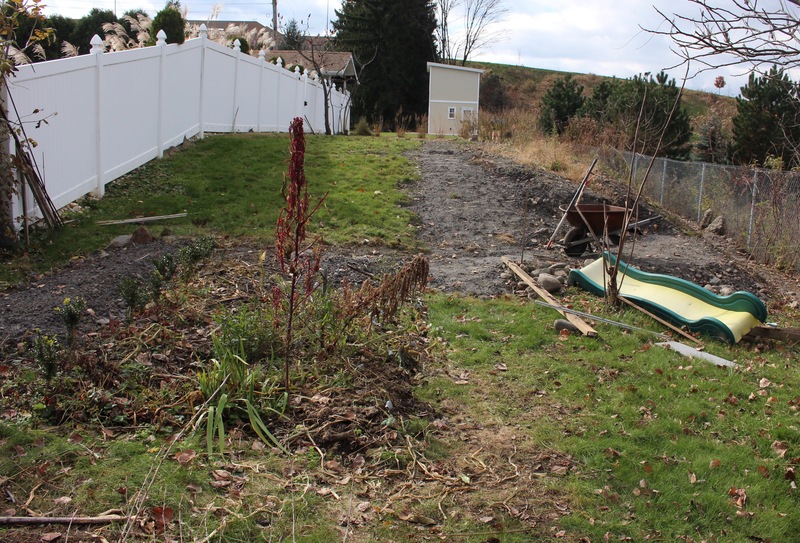 Plus it still looks decent, especially since the haggard and rough looking sunflowers were cut down and hauled off. 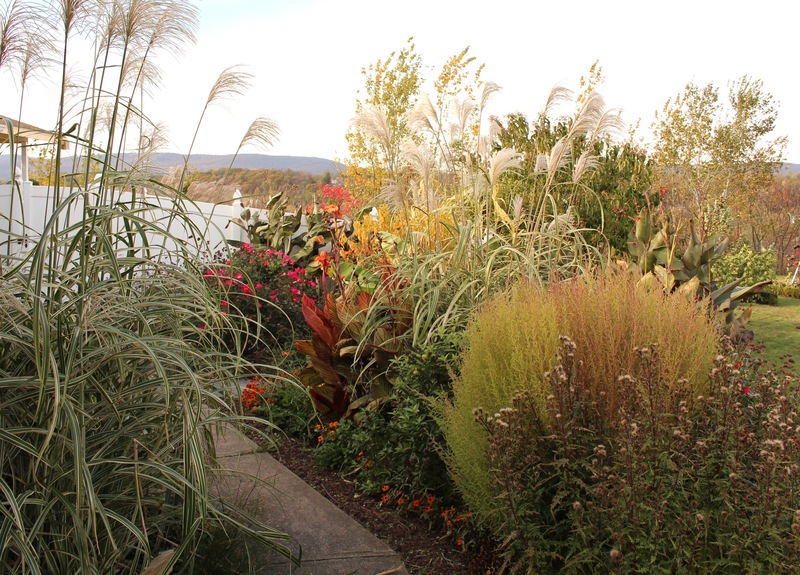 The perennials are drying up but the non-hardy canna and cardoon are still full of life! Not bad for the last day of October, trust me it usually doesn’t look this nice. There are only a few other plants which look interesting in the close-up. 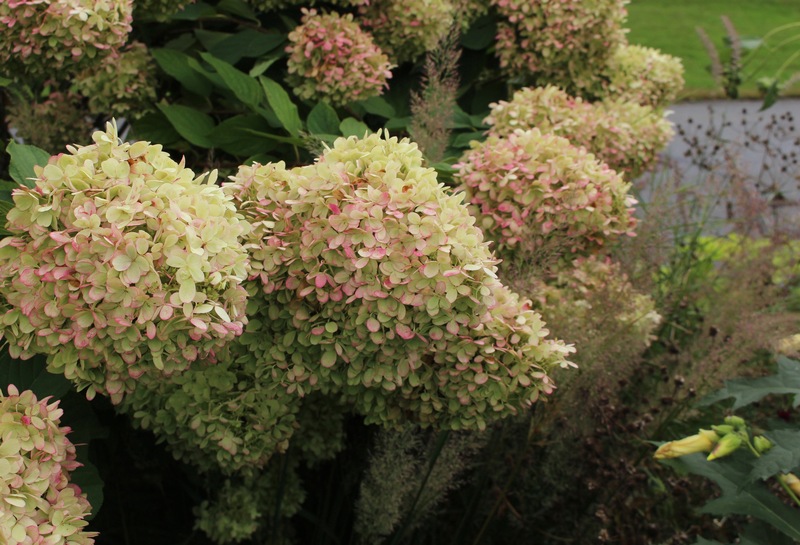 Hydrangea ‘Limelight’ has never been this pink before, I think it’s thanks to the steady rains which kept it hydrated all summer. We did get three weeks of hot and dry, which browned the south side of the each panicle, but overall they’re still attractive. 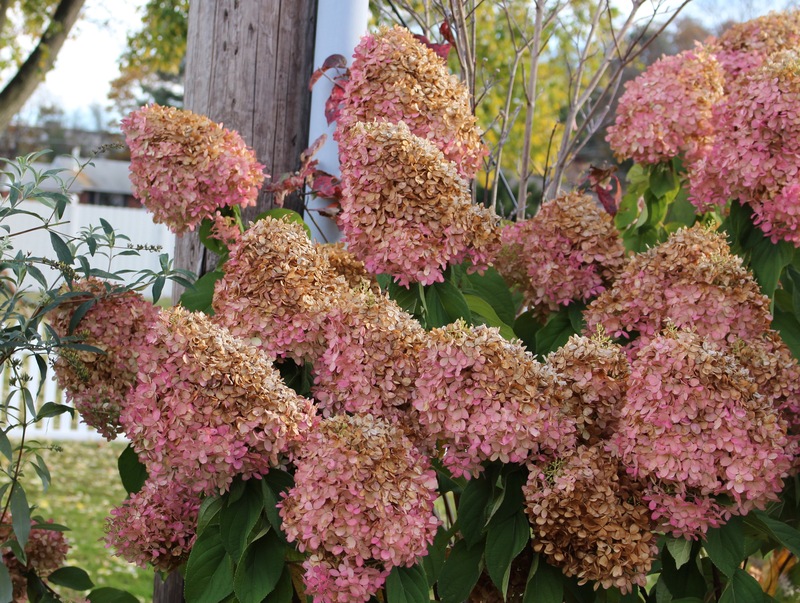 Drought and heat-stressed brown is the normal fall color for these, I’ve got to say I much prefer the pink! 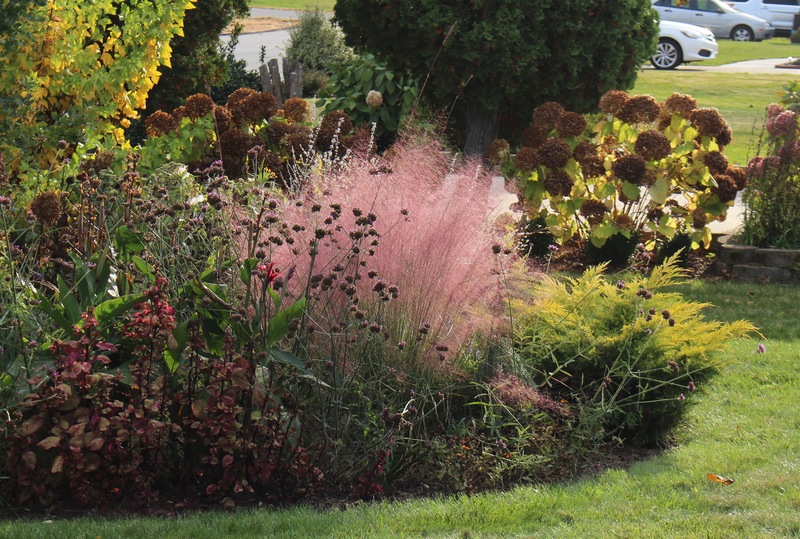 The muhly grass (Muhlenbergia capillaris) is also finishing the year off in pink. A normal year has frost bleaching the color just as it begins to flower, but for the second year in a row we’re in luck. Like most grasses it’s the perfect thing to have backlit with some nice, soft, autumn light, but on the other hand a smarter gardener would have already found something equally as fluffy which is a little better suited to growing in this northern garden. Pink muhly grass with just a little backlighting. So that’s where we are as we step over into November. The summer annuals have all thrown in the towel but there’s still enough left to keep things interesting for a few more days. Bulbs will be the last question of the year. Right now I say no, but clearance sales have a way of twisting my arm and you never know. In the meantime have a great week! Well that lasted about a week. I miss summer and wish autumn would get on with it. Yesterday was beautiful, but today it’s colder and rainy, and I’m sure the wind is pulling down all the autumn foliage just as it finally colors up here in the valley. 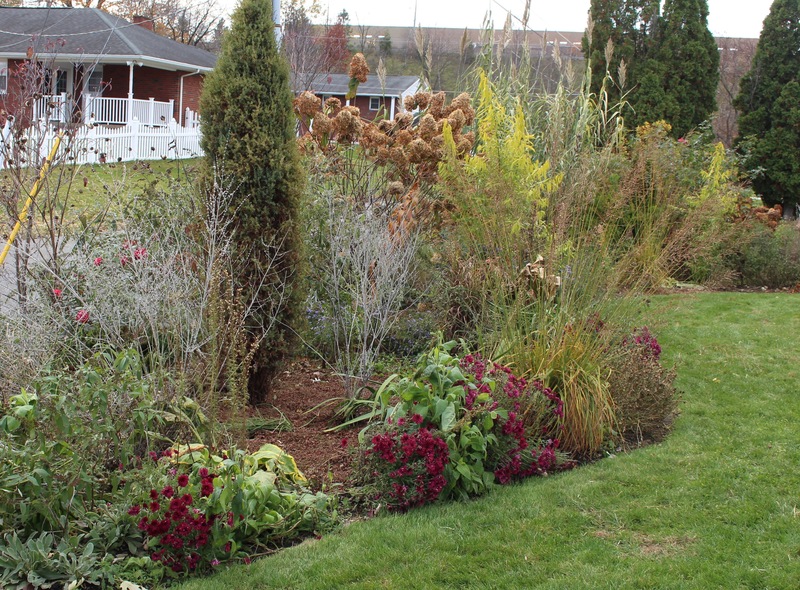 Here are a few spots in the garden, maybe when I look back in January the cold and ice will put it all in perspective. Frost is forecast for tomorrow night nearly everything still needs to come in. Sadly enough I have less than 24 hours left to procrastinate. I spent most of Saturday just wasting time. The weather was nearly perfect and the schedule was open, but 90% of the day was spent watching grass blow in the wind or birds picking through seed heads and nearly no time time was spent productively. If we had to separate into ants and grasshoppers, I’d be all grasshopper this weekend. 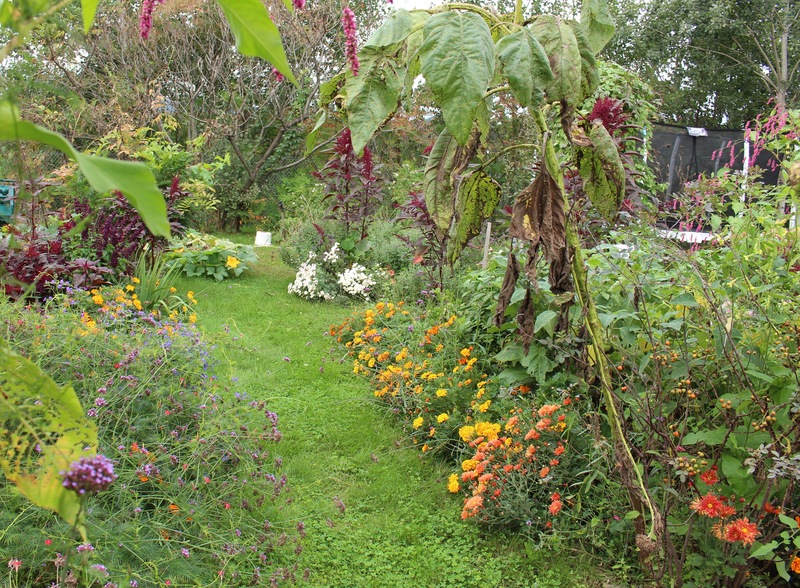 The potager is all ready to fall apart for winter with everything dying back and going to seed. Peppers were harvested, the rest is on its own now. I guess I did mow the lawn on Friday. It didn’t really need it but the mower made quick work of stray twigs and leaves which were starting to pile up and with the mower set to mulch it was not much of a commitment at all. Also it kind of chopped up the turf clods which lay all around the back yard courtesy of Mr. Skunk. Someone suggested I replace and tamp down all the clods before mowing… I gave him the look and said he was more than welcome to do that in his own yard. Here we prefer to thank the skunks for their free grub removal and turf aeration services and let winter work apart the clods. Back behind the swingset, the meadow looks downright respectable again after a few mowings. Mowing the lawn takes a little longer these days now that the meadow area is back on the weekly cut plan. To those who thought the tall grass was a reservoir of dangerous ticks and snakes and spiders this comes as a relief, but to me it’s all just part of getting the turf ready for next year’s show of spring bulbs and early summer wildflowers. 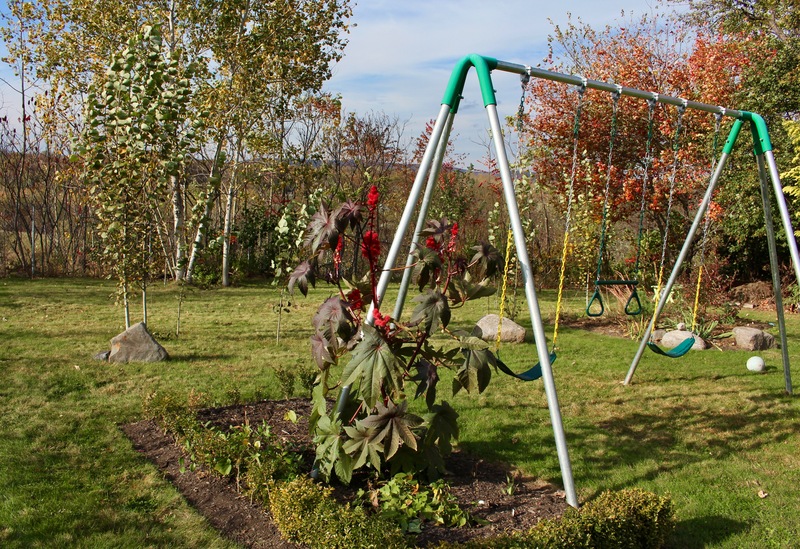 It will sprout up again just fine next spring, and ironically enough the most dangerous thing back there still remains within inches of the swing. The bright red seed pods you see belong to the castor bean plant(Ricinus communis), and as you may know the beans are the source of the poison ricin. Smaller children would need to be watched, but based on what a struggle vegetable eating is in this house I’m pretty confident my own kids won’t be picking beans up out of the dirt and eating them any time soon. The tropical garden just before the frost. Not as lush as last year but the grasses are still a good 8+ feet tall, and overshadow the not-quite-as-tall-as-last-year cannas. I may not have done much in most of the garden but at least I did pay some attention to the rock garden. It still doesn’t have any rocks but at least the yews are trimmed. Weird that out of all the things to do this time of year I’d be trimming up little yew meatballs, but there you have it, Saturday’s big job. Here’s a photo from a few years ago to give you an idea of where we came from. 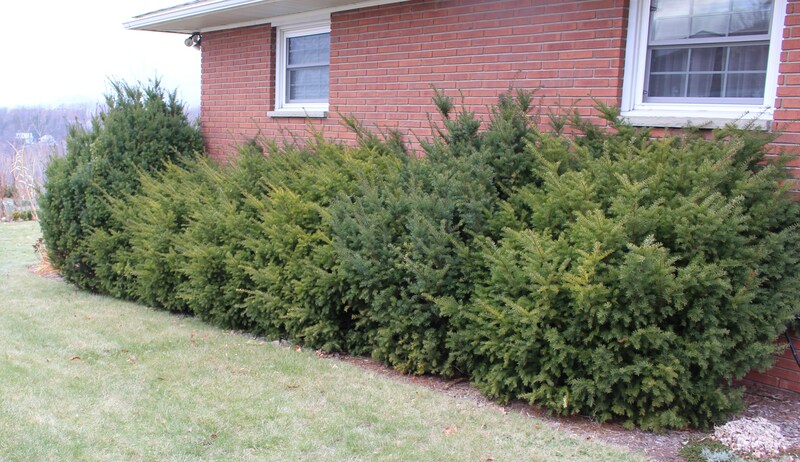 Every spring… trim the yews… I finally got so bored with it I let them go, but after a few years the neighbors started talking. 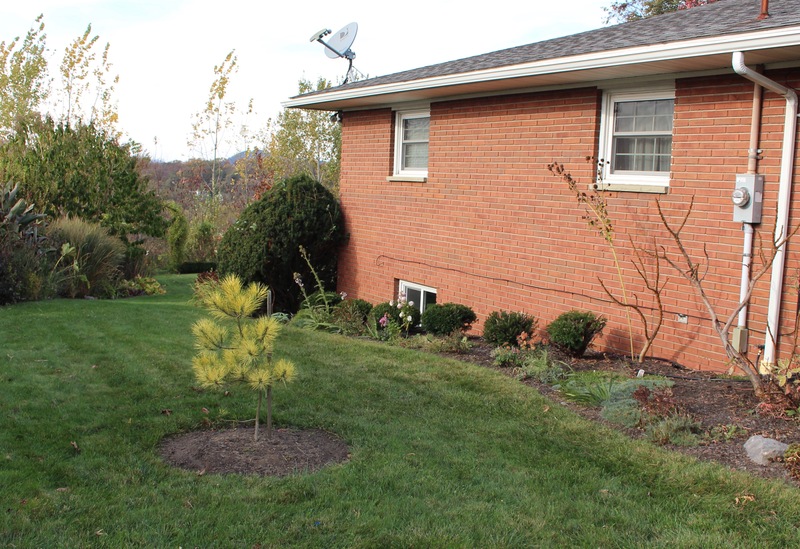 Two years ago I trimmed the yews back to within a few inches of the ground. It was either that or remove them completely, but after the struggle of taking a single one out (so the electrician could rework the electric service), I suddenly warmed up to the idea of keeping them. So now I have little yew nuggets along the foundation and an empty south-facing mulch bed which seems perfect for rock garden plants. I’ve already filled most of it and it’s a constant battle to keep from doubling the size of the bed. The rock garden. You may see a single rock to the far right but for the life of me I don’t know how the name started. -Btw the pine is Pinus densiflora ‘Burke’s Red Variegated’. I love it. Eventually I’ll need to get moving if I really want to be serious about gardening again next year. Beds need cleaning, plants need saving, things need transplanting. There’s always plenty to do but in the back of my mind I keep figuring that cold indoor days are coming and I should take advantage of the last warm days. That probably means doing things, but a little soaking it up doesn’t hurt either. We will see how this handles a little frost. All together I think I found about 20 of the odd little Yugoslavian finger squash once I started looking around out back, and between those and a few mums I think we’re decorated. Tomorrow I’ll be running around. Or not. Most of the geraniums, amaryllis, and cordyline spikes can handle a little frost and should be ok for another week or so, so I guess it all comes down to seeing how long I can postpone the inevitable. Geraniums (pelargoniums) lined up and ready to come in. Between these and a few cuttings already under lights I think I can give any geranium-loving granny a good run for her money. Frost will come, the garden will go to bed, and the dreams of spring will start. I’m sure there are still plenty of perfect days to come but for now I’m dreading the end, and even worse when the clocks fall back next weekend. I wonder if it’s too early to start thinking about snowdrops. … haha, who am I kidding, I’ve already been obsessing about them for the last month! Autumn. It Could Be Worse. I’m ok with summer being over. Not excited, but ok with it, and I guess that’s good enough since neither myself nor anyone else can do much about it anyway. Fall follows summer and that’s just the way things roll here in NE Pennsylvania. At least we have butterflies this year, and in this garden the butterflies have been the highlight of every garden stroll. 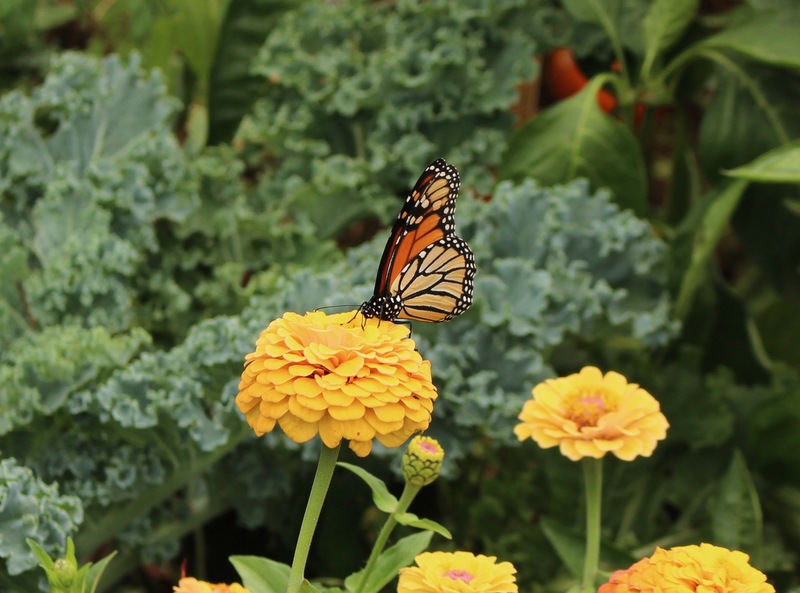 Monarch butterfly on a zinnia in the potager. People enjoy talking about how beneficial butterflies are and I’m not going to argue with them but if you think about it they’re right up there with cabbageworms and tomato hornworms in terms of caterpillar crawling and plant eating. They don’t do all that much to benefit the gardener, but they’re just so darn pretty to look at. 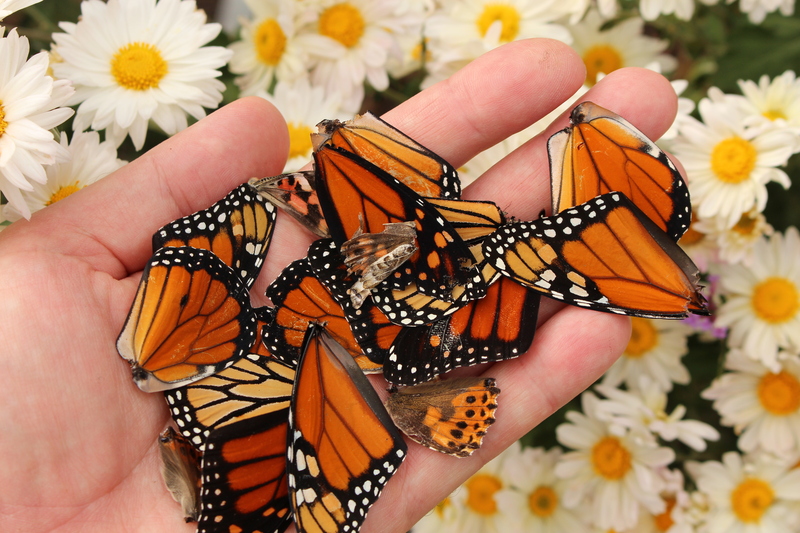 A handful of butterfly parts. Not a good sign for the butterfly lover since no butterfly sheds its wings willingly. 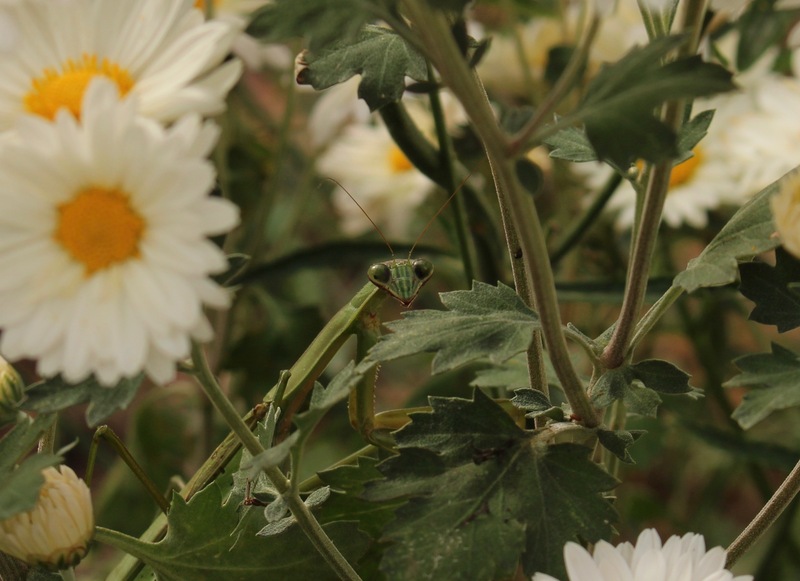 If you want to consider a beneficial insect the praying mantis might come to mind. Maybe. Not since the garden of Eden has all life pleasantly revolved around working purely for mankind and the praying mantis is definitely a New Testament kind of creature. Its instinct is to kill and eat (not necessarily in that order) anything from bees to grasshoppers to butterflies and it doesn’t matter if the gardener would prefer the later to stick around (uneaten) for pollination purposes. Scattered butterfly wings under your flowers is a good sign of a fat mantis above. The guilty party lurking amongst the flowers of a chrysanthemum. 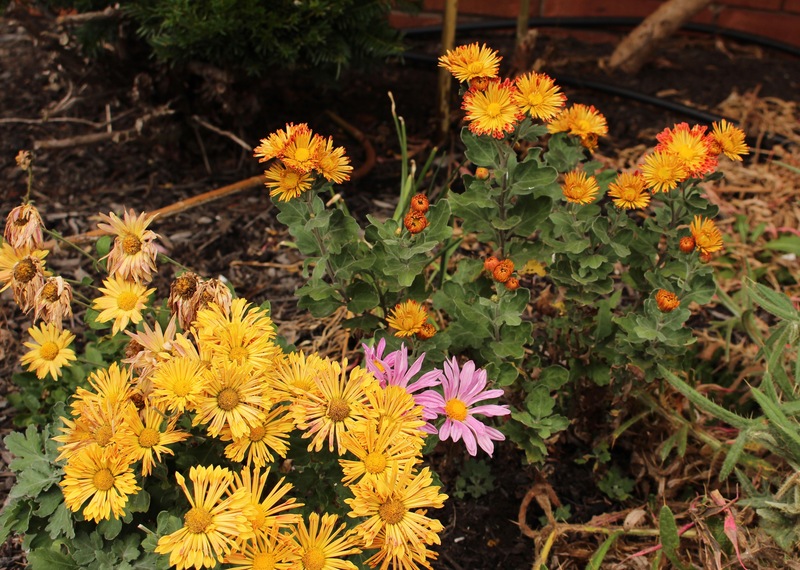 The chrysanthemums are only second party to the carnage. It’s not their fault they’re so attractive right now right as the Monarchs are moving through. Some seedling chrysanthemums from a few weeks ago. 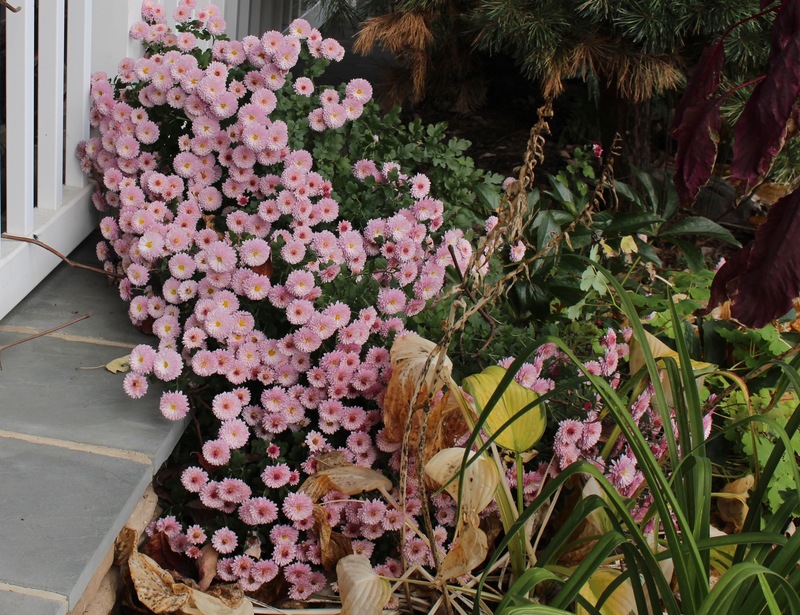 I couldn’t care less about chrysanthemums in April, but now as everything else is calling it quits I wish I had an entire border of them. I bet I say that every fall but your guess is as good as mine as to if it will ever happen. So far the one thing I have managed to get done is collect, and grow (and kill) quite a few different mums and fortunately manage to have a few nice ones left to flower each fall. 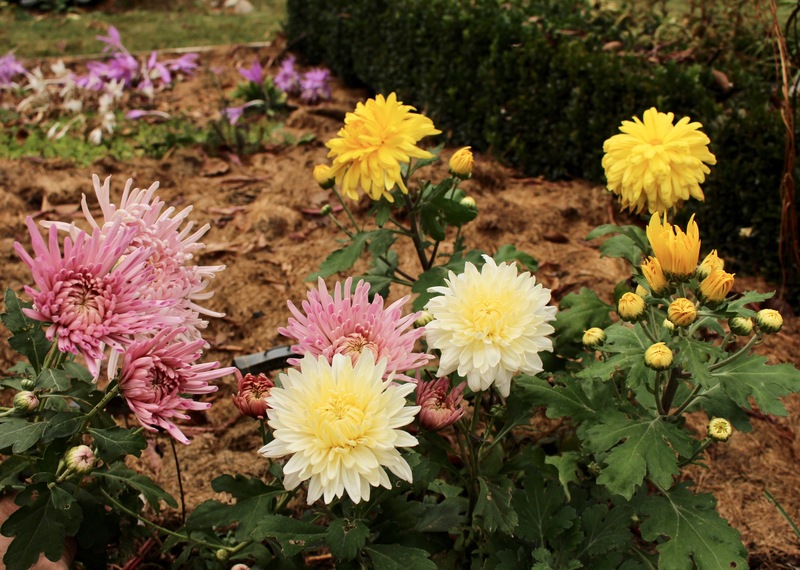 Chrysanthemum ‘Centerpiece’. Perfectly hardy for me and an interesting flower form, but she always insists on starting the season in August, way before I’m ready to look at mums. What I really want is some of the big “football” types, ideally the obscenely large, overfussed, and overfertilized types which show up in the better greenhouse displays at this time of year. There’s about a zero percent chance of that happening but it doesn’t stop me from hoping that someday, something close to a miracle will take place, and one of my larger flowered types will do the impossible. For now I’m just happy I found (mailordered from Mums of Minnesota) a few ‘footballs’ hardy enough to overwinter here without me jumping through hoops… or even just jumping anywhere… I’m still feeling seasonally lazy. 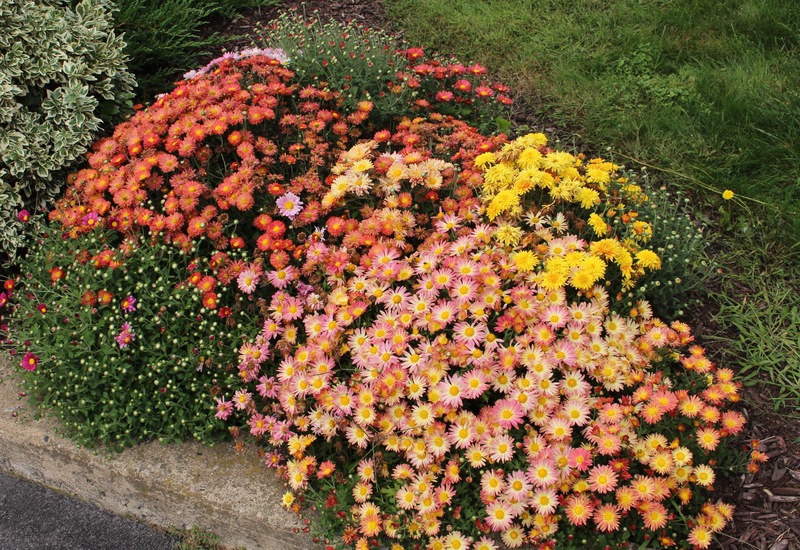 A few football mums which survived two months of potbound abuse and then a way too late planting. I like them all but the pale yellow ‘Mellow Moon’ at center is my favorite. Although I’ve been ordering and labeling and trying to keep mum names straight, I’m much less snobby about the chrysanthemums than other plants such as say… um… snowdrops. My barren soil seems to make an excellent seedbed for mums and I try not to rip them all out during those frantic days of May. I planted ‘Dolliette’, the smaller quilled flower in the back, but the others including the pink are just surprise seedlings which popped up around her. I welcome the seedlings, I welcome the fussier ones, but I also welcome any leftover autumn decorations found on our or the neighbor’s porch. Most of these disposable greenhouse mums don’t make it through the winter, but a few surprise us with green life in the spring. These leftover porch decorations have been here for a while, surviving drought, disease, and neglect. 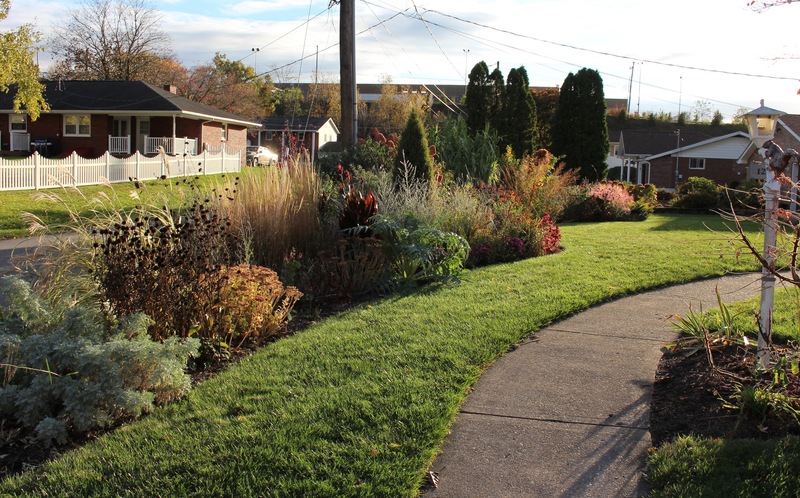 This spring I moved a few of my favorites next door to ease the monotony of mulch and I’m quite pleased with the result. 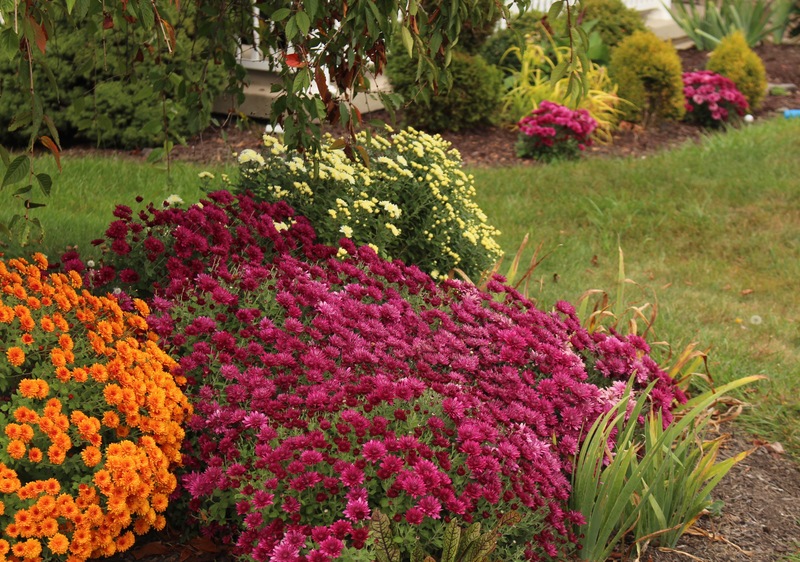 The mums and Monarchs may be stealing the show but the beautiful weather sure doesn’t hurt either. Our gardener did make an effort last week to mow and trim and between that and the greening lawn I think he may eventually snap out of his autumn doldrums, but when temperatures are so comfortable and the lighting is so relaxed I don’t see much hope in the way of any major garden projects being started. 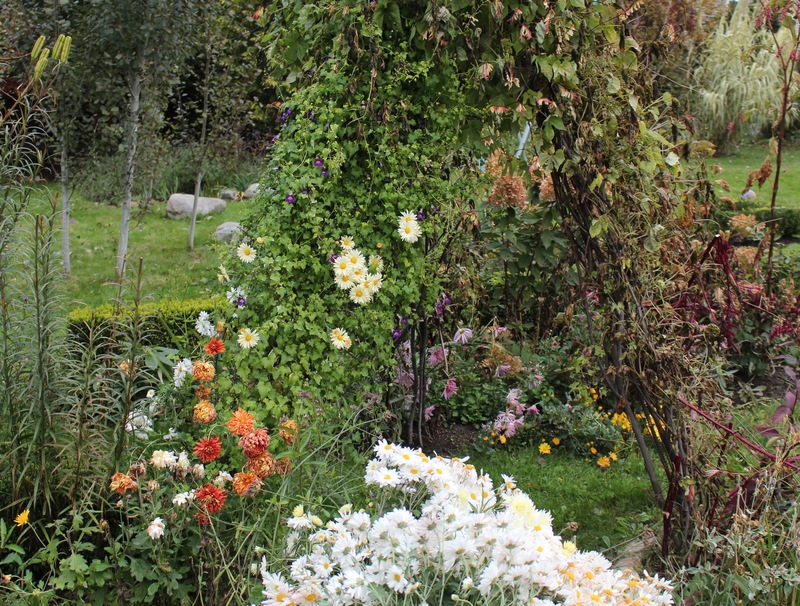 The front border with some nice autumnal light. 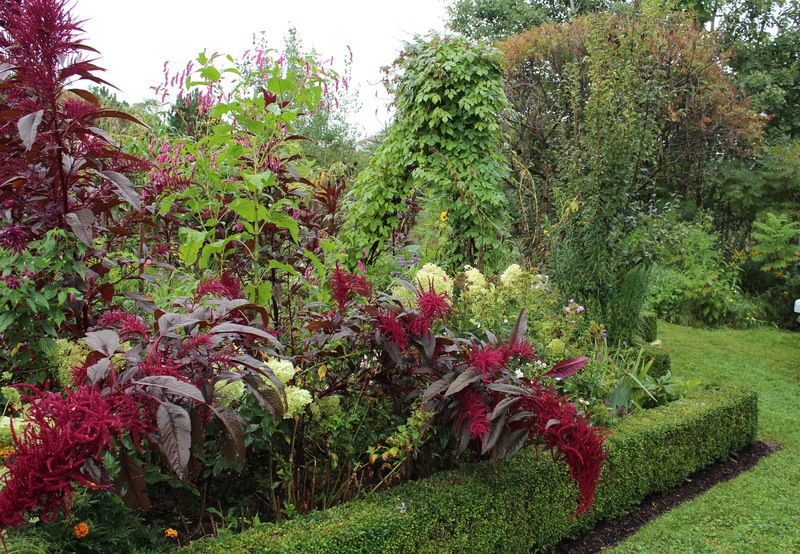 The brown amaranthus dead center really does detract from the view, but…. I’m fine with enjoying the weekend while the weather is still on our side. 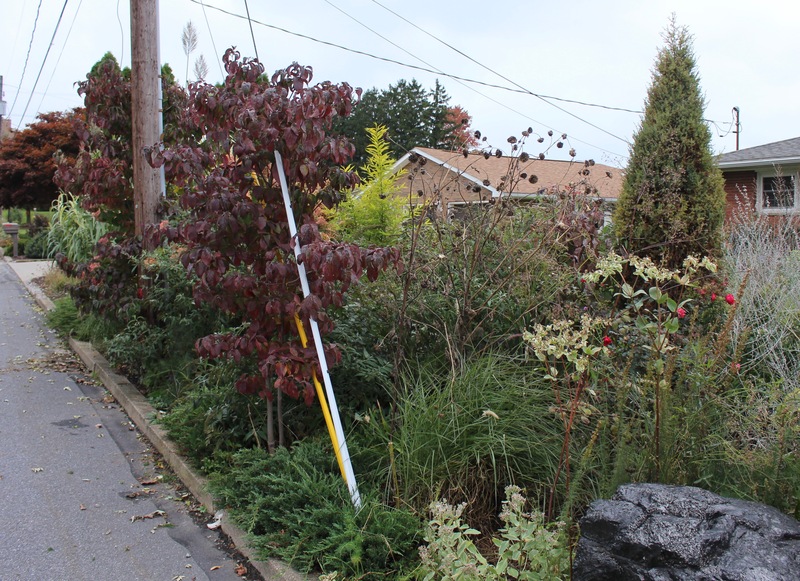 There’s always next week to start fall cleanup and if it doesn’t happen…. maybe the winter winds might do just fine on their own. As long as I dig up the dahlias and cannas before December, that’s the kind of timetable I have in mind. Have a great weekend!